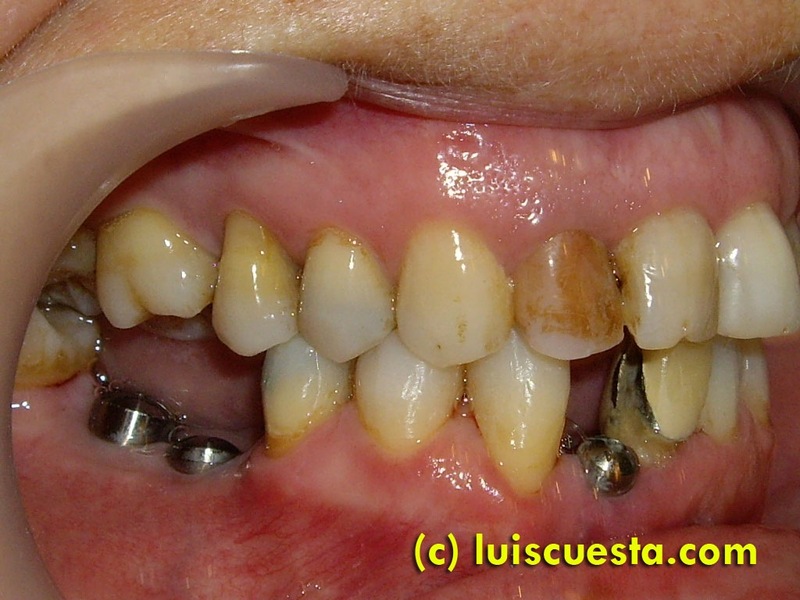 Old metal-ceramic crown work over devitalized incisors. 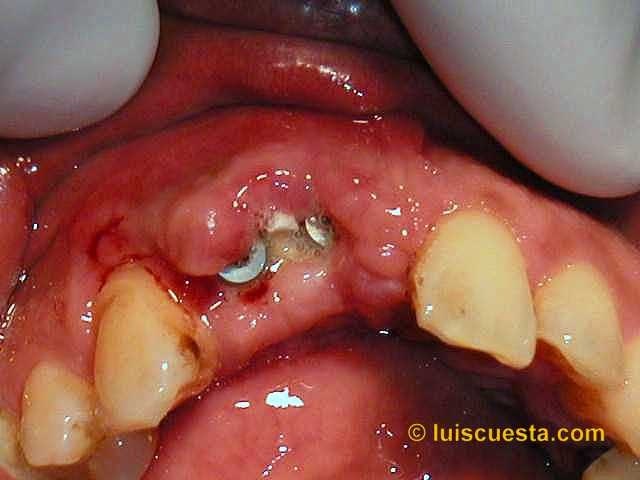 Periodontal abscess, retracted alveolar front wall, frontal gingival recession, central incisor presenting endo-periodontal injury around root apex. 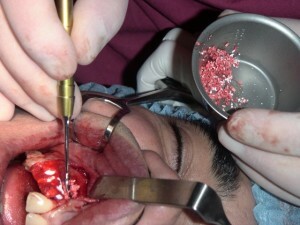 Extractions are done and an immediate removable prosthesis is placed during the healing period. 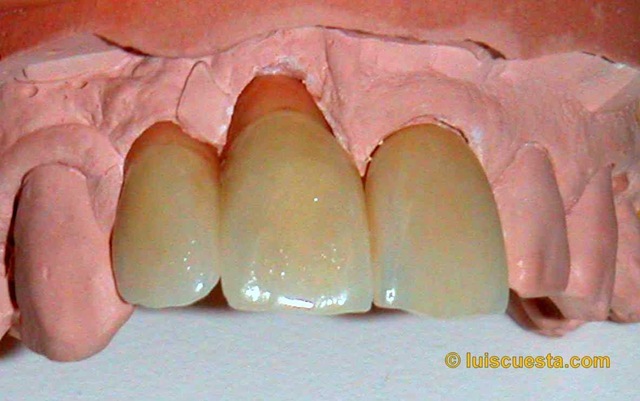 Acrylic relines are successively done to keep contact between the resin and the gum, in order to prevent further resorption. 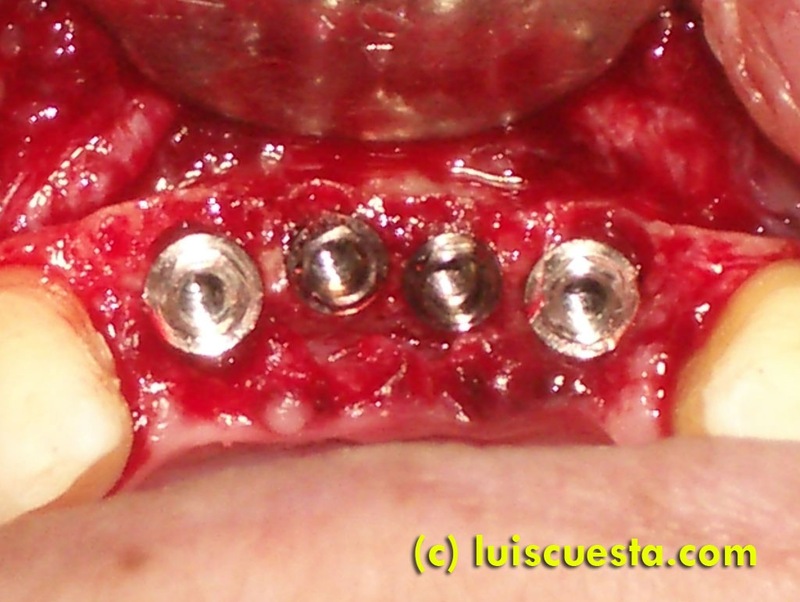 One thing should be taken into consideration: a different approach could be done by filling the sockets with bone graft and covering them with a membrane. 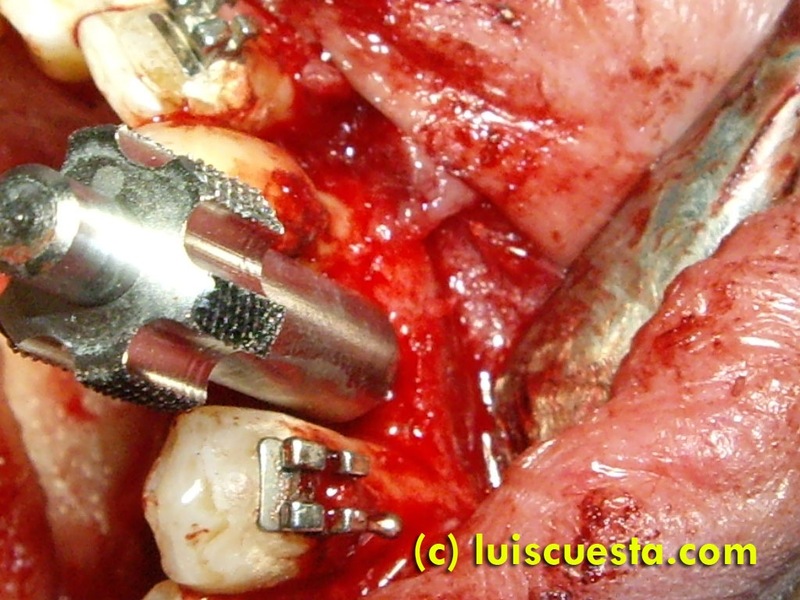 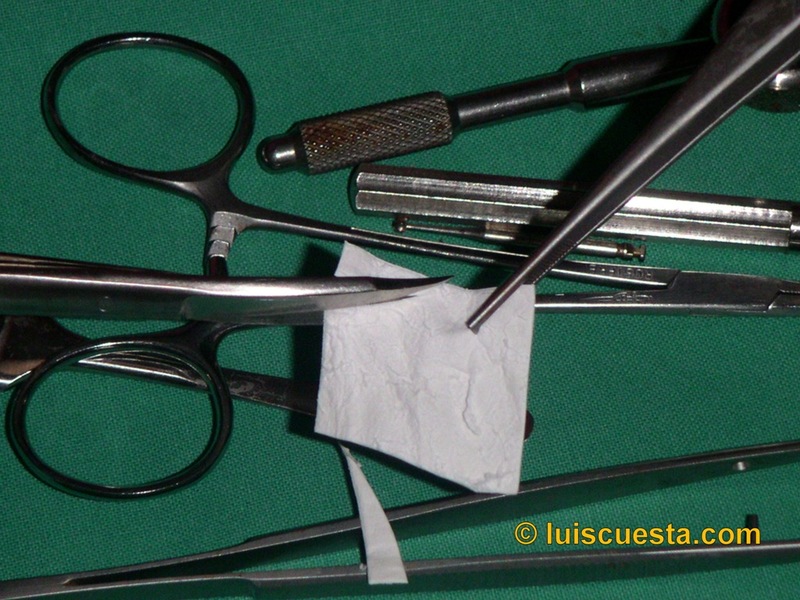 With the existing endo-perio pathology it may be a safer play to let it heal by itself. Second, there is short soft tissue over the central incisor as to cover the resorbable membrane. 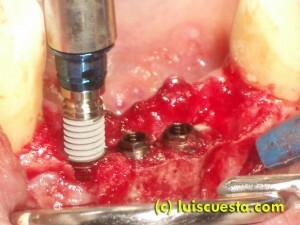 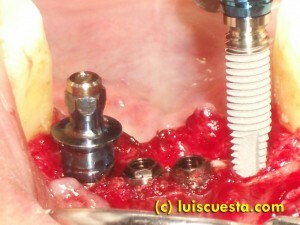 The two implants are placed along the convenient axis, already expecting exposure of a few threads. 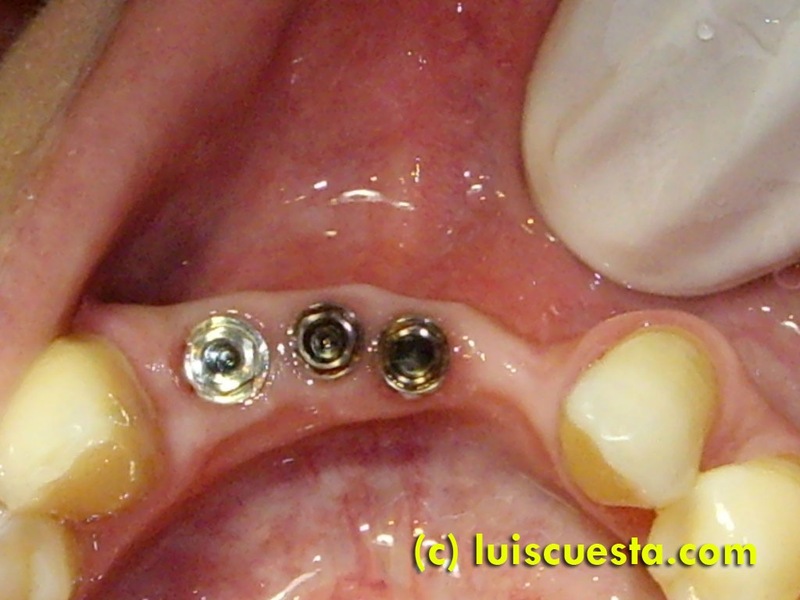 The Bio-Guide membrane is cut to fit in the edentulous gap, holes are poked to screw the implants’ healing screws throw it, acting as fixation. Enough membrane margin is left to fit under the palatal flap and several holes are poked on the apical end of the membrane. 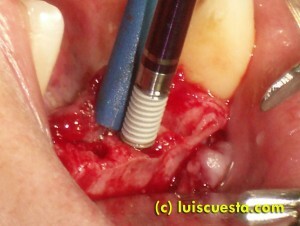 First, to drill through the pin retention. 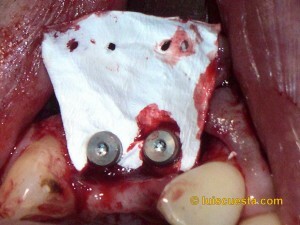 Second, to nail the pins through. Once the pin holes are drilled with no tension on the membrane (it should be baggy enough as to allow for sufficient graft volume), a little blood is extracted, mixed with Algipore, and placed over the implant’s threads and the bone concavity. 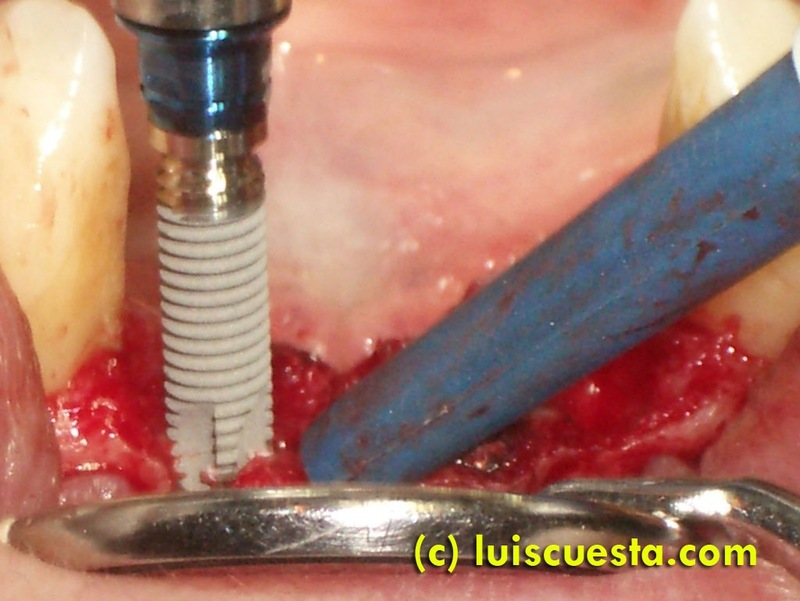 The resorbable pins are nailed carefully fitting them through the membrane holes and into the previously drilled socket retentions. 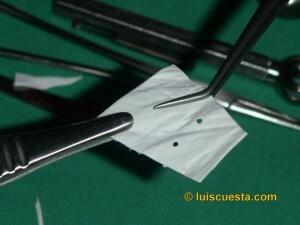 Periosteal cuts are done under the full thickness flap. 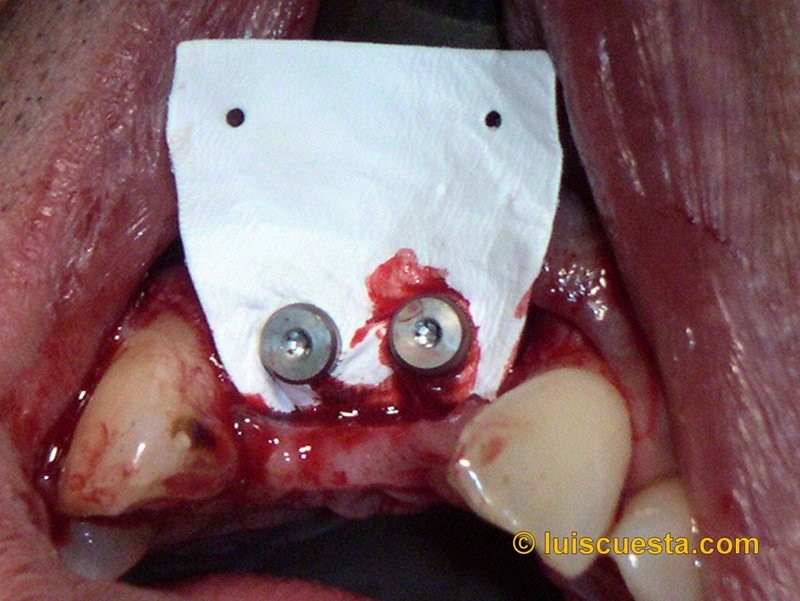 This permits further elongation of the flap in order to close the wound over the increased volume base. 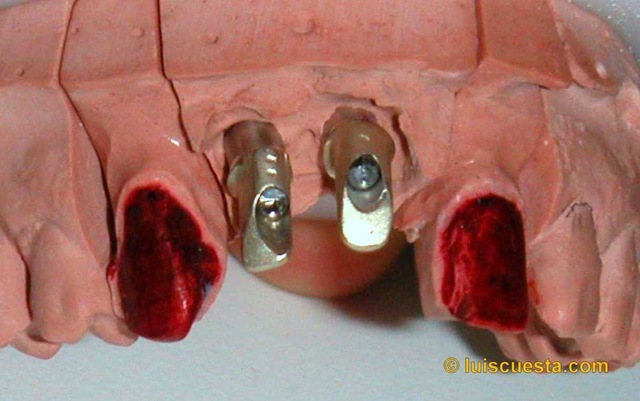 The acrylic removable prosthesis is immediately relined to fit over the suture and checked up periodically for later relines in order to keep contact with the gum. 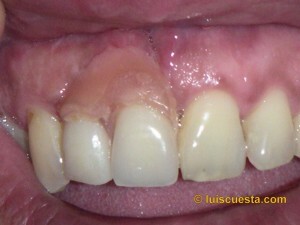 During the try-on, the left central incisor doesn’t fit precisely. 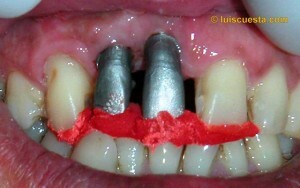 Maybe due the tooth migration, maybe due to impression accuracy. 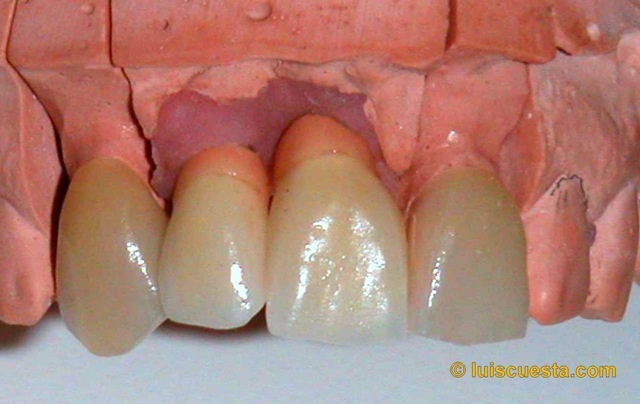 So the cuspid’s veneer is cemented and second impressions are taken for the final result, incorporating pink ceramic to disguise the implants’ high emergence. 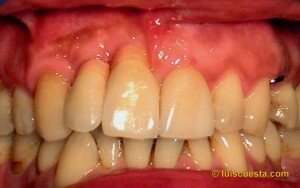 Lower incisors. 4 immediate implants. 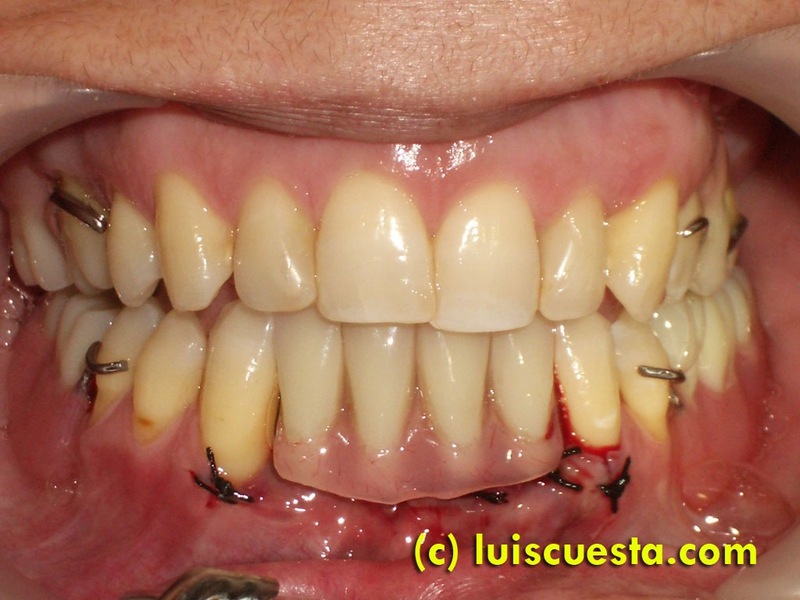 This case shows the substitution of four periodontally damaged lower incisors by four 3i implants 3.75×15” and 3.25×15”, one of which failed in the following weeks after insertion. The patient had annoying mobility in the incisors and wanted to replace them. 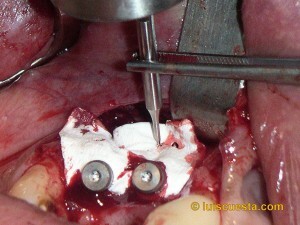 She didn’t want to hear about extracting the other teeth for a 6-implant fixed denture, for example. 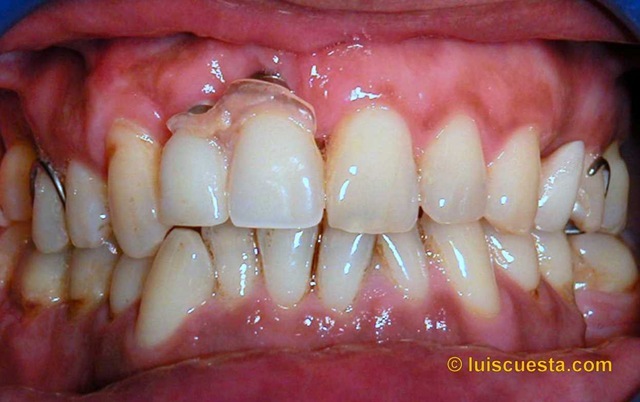 Normally, four lower incisors can be replaced by two implants and four crowns on top. 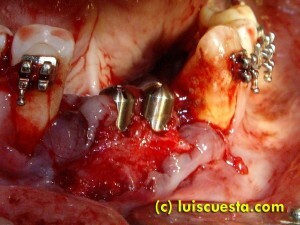 She just wanted four implants as replacement, which is very critical surgery as we will see. I extract the teeth and analyze the ridge. I find insufficient width in the central as to place the narrowest 3,25”implants. 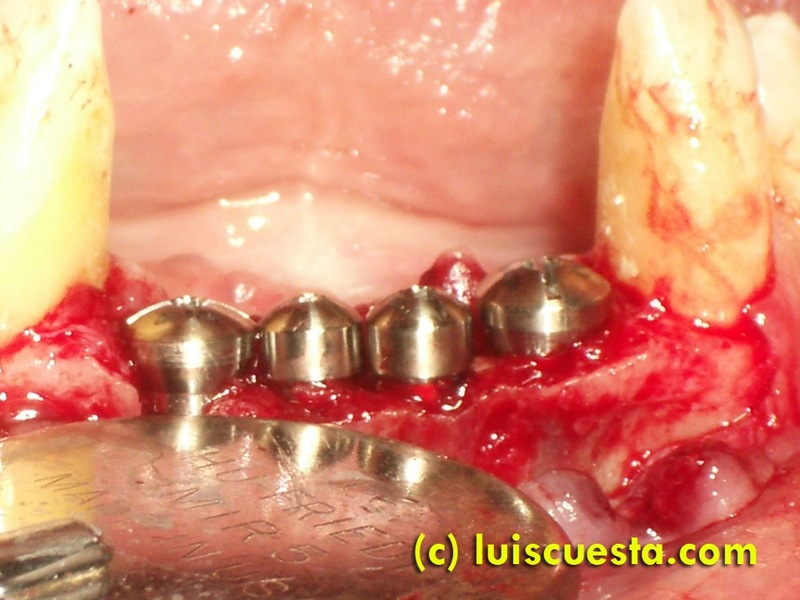 So, I expand the ridge to the limit of its elasticity with a set of expanders, gradually bigger and simultaneously on either central alveolus. It’s a very critical maneuver. 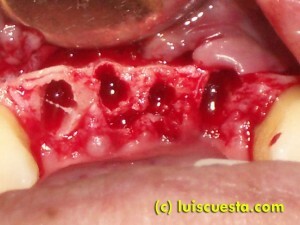 You need to stop when either the bone starts to crack a little or you reach enough with before that happens. Then, it’s time to place the implants. 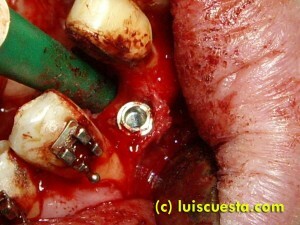 3i 3,25” implants are very delicate. They have many narrow threads. 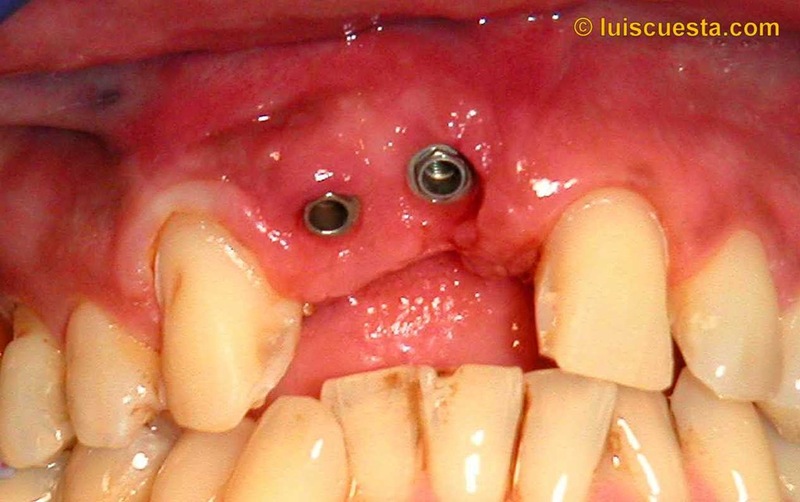 They need many turns to be screwed. 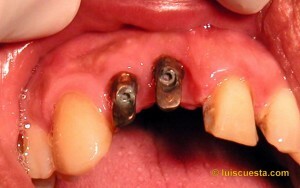 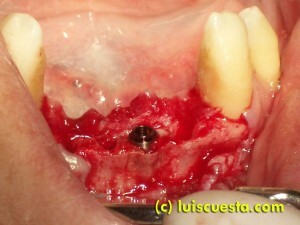 If you drill or expand too much, the implant may be loose. 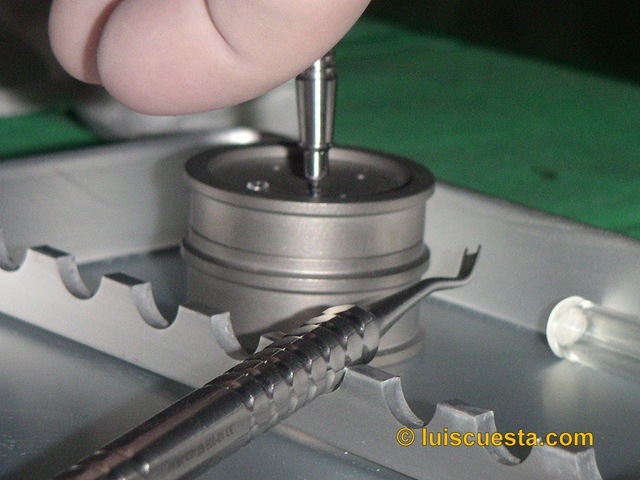 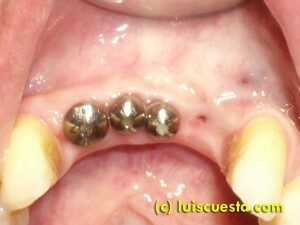 If you drill or expand too little, they may need too much torque, with the risk of bone heating and failure. 3,75”implants are easier to handle. 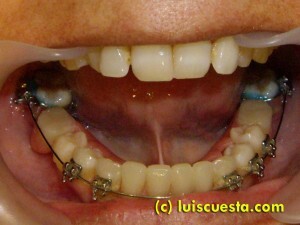 They are more “self-tapping”. 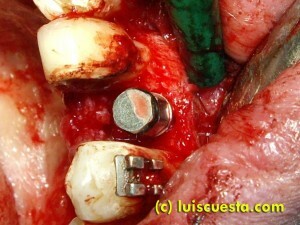 Still, the error margin is close to none with such little space. 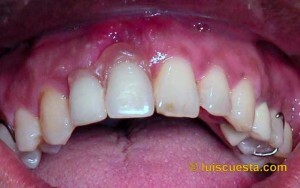 Healing takes place with increasing pain in the 42 area. 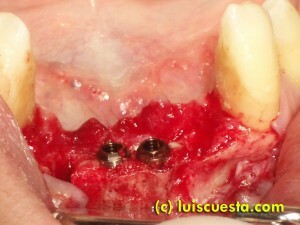 Maybe bone heating, maybe lack of hygiene… implant on 42 failed and I had to remove it. 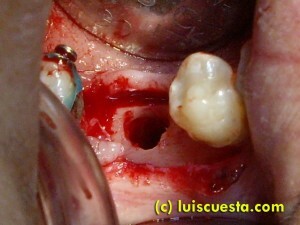 I healed with great resorption, so I abandoned the though of placing another one, since three are more than enough. And the final panorex, before fixing the prosthesis. 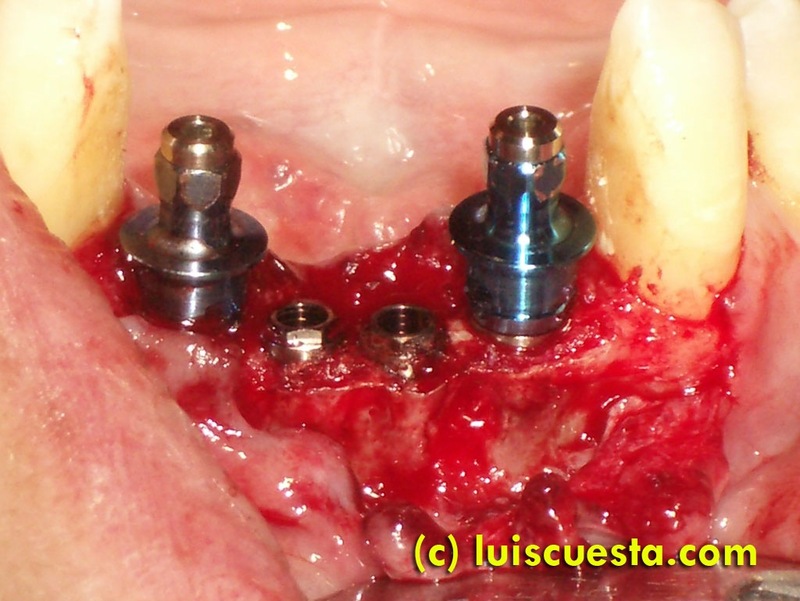 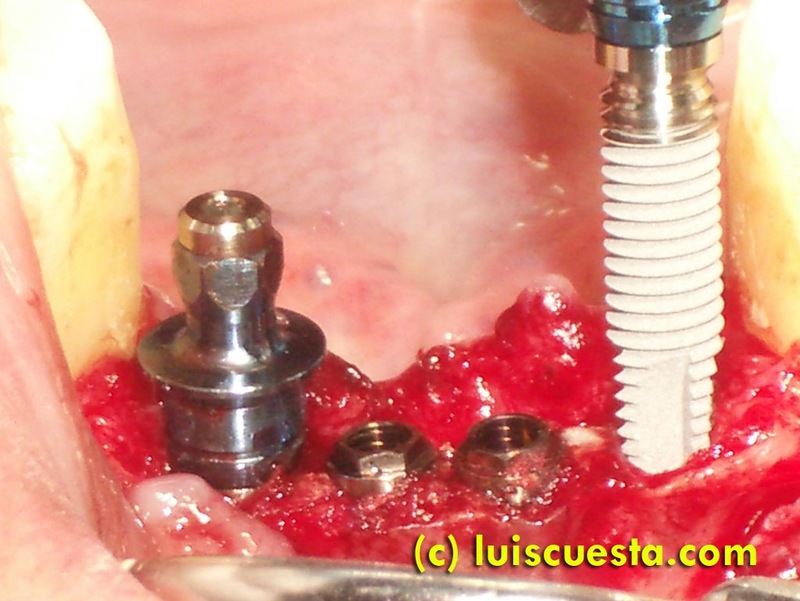 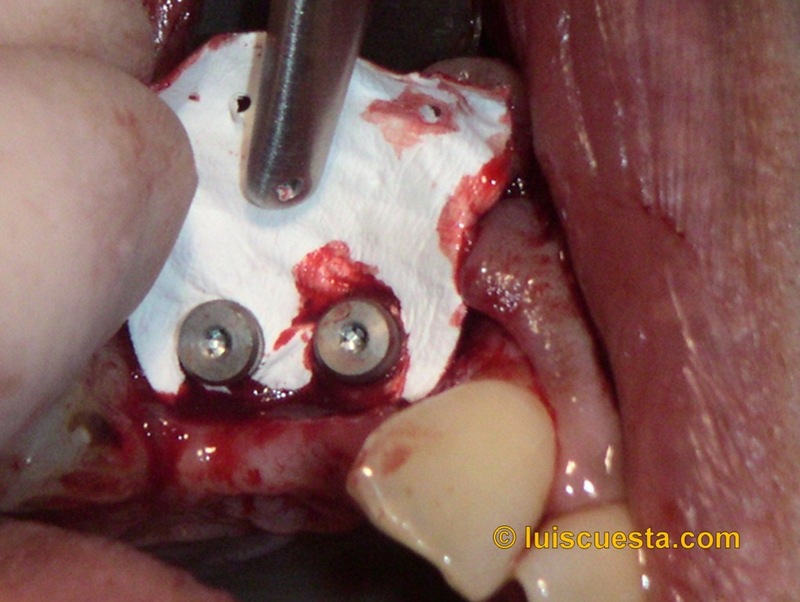 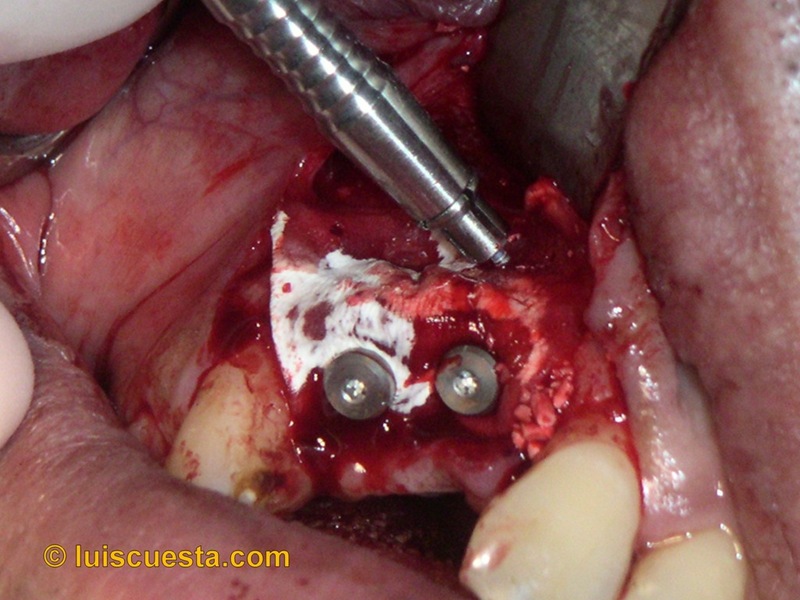 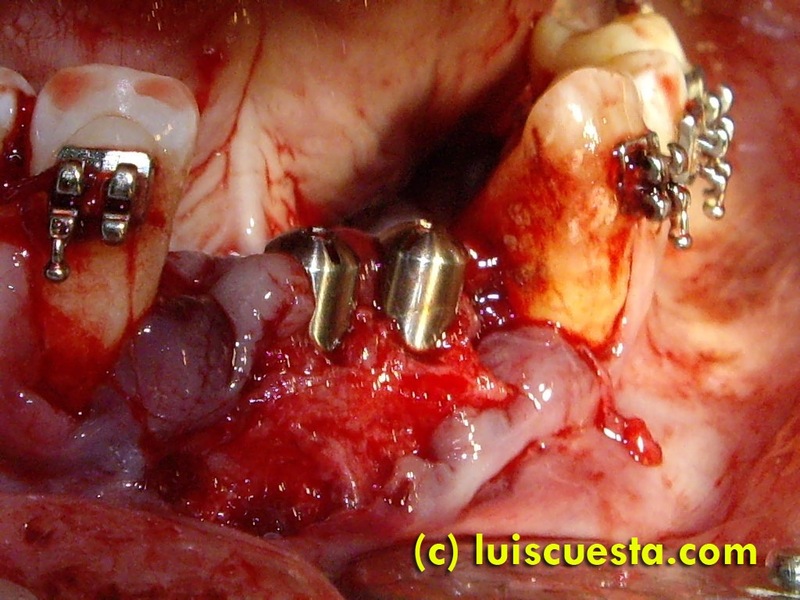 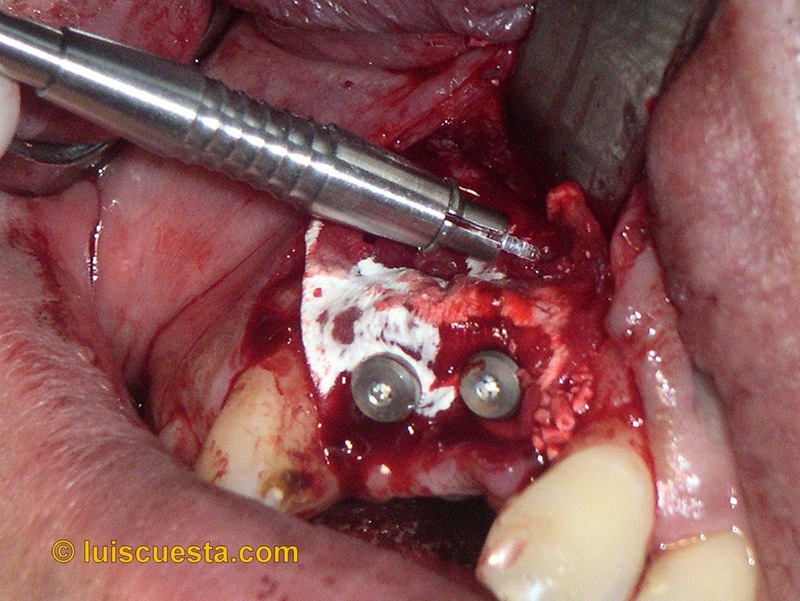 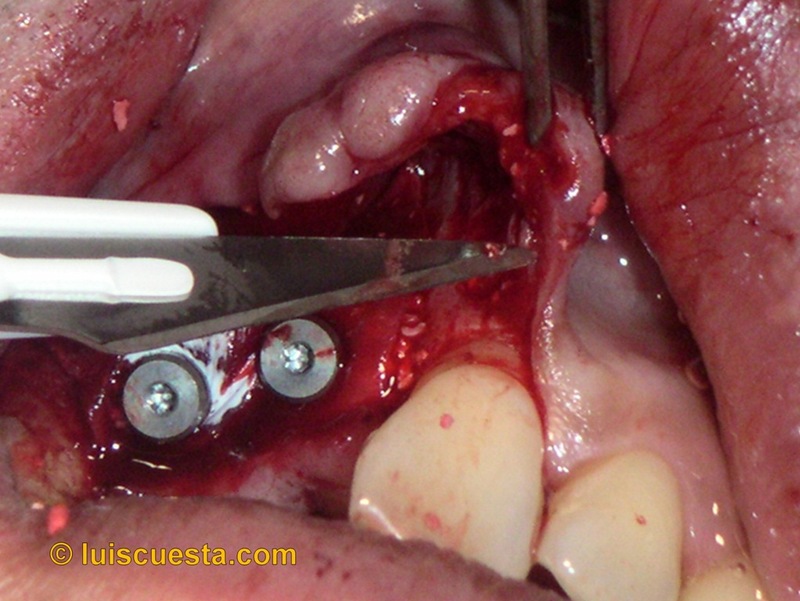 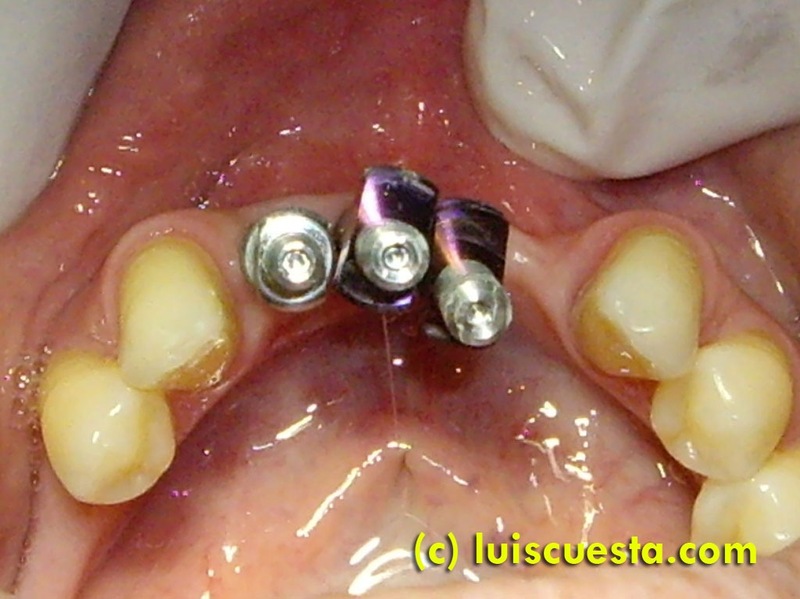 Single implants and orthodontics in lower jaw (II), with periodontal disease. 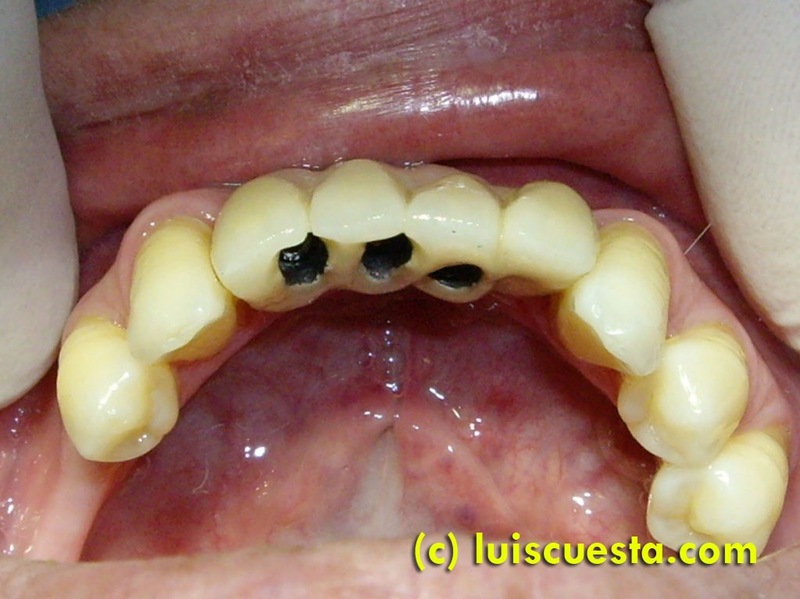 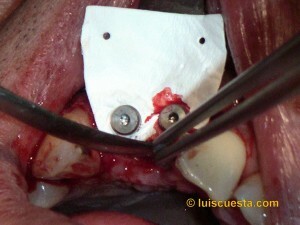 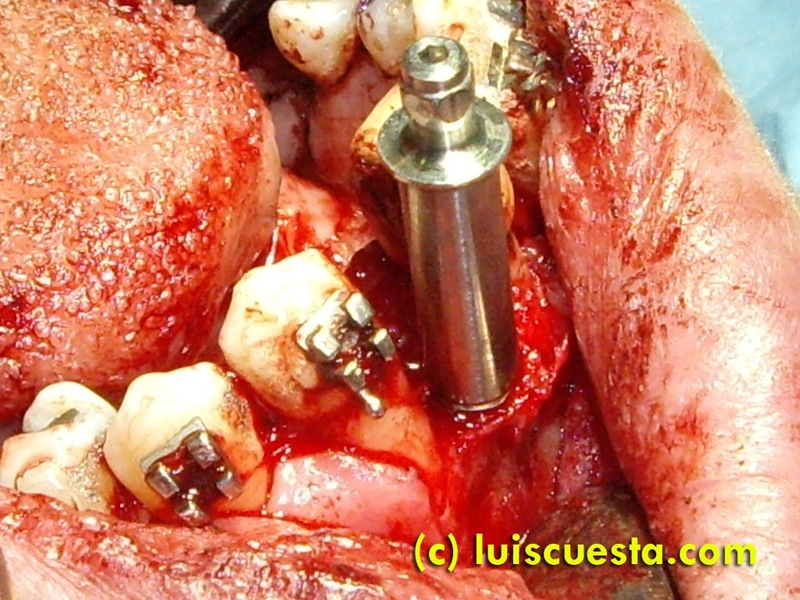 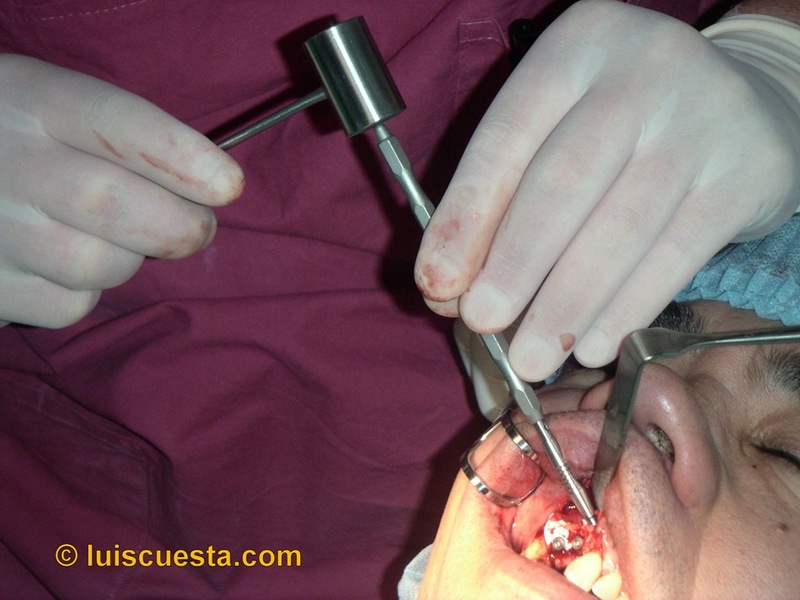 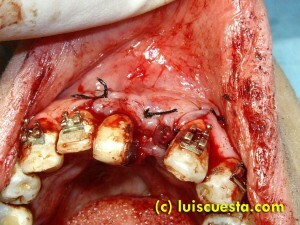 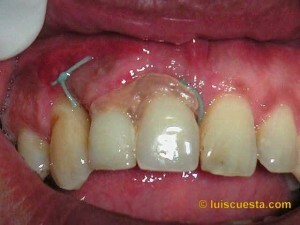 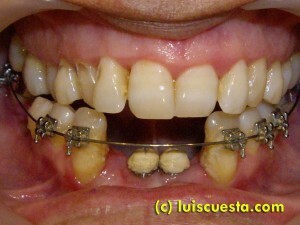 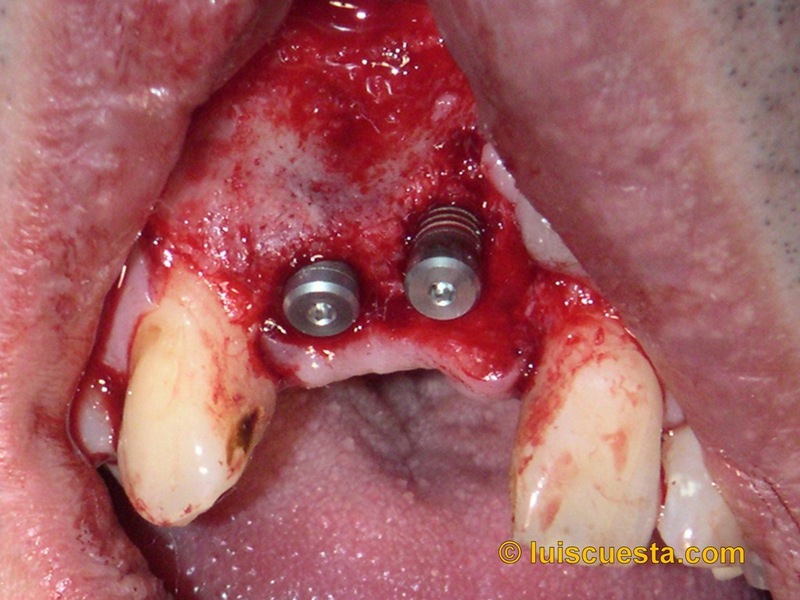 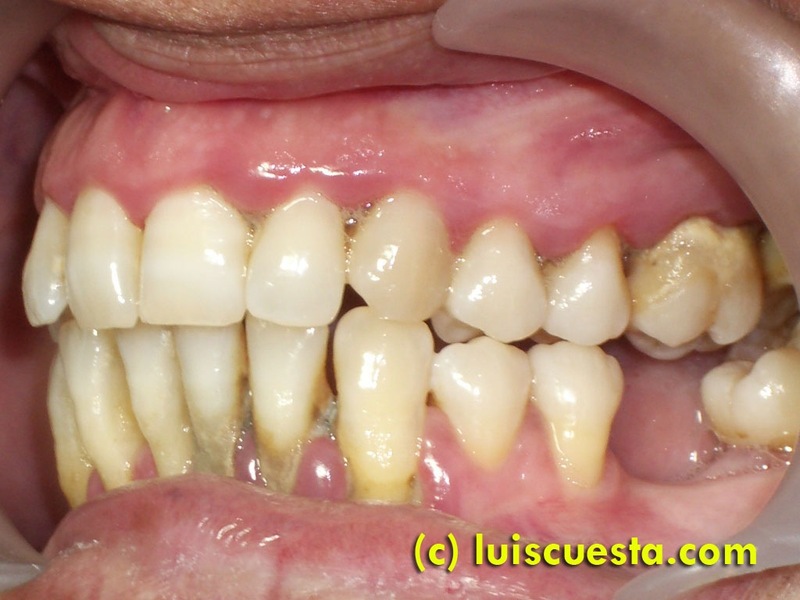 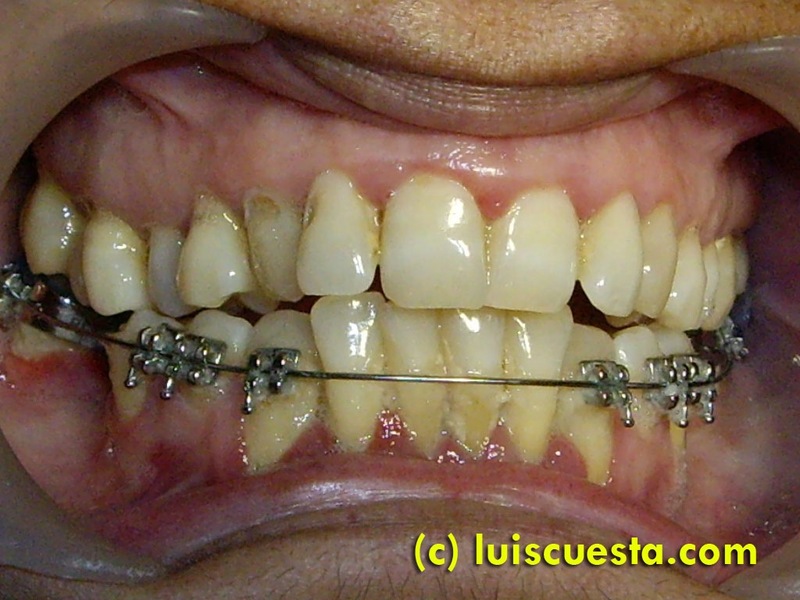 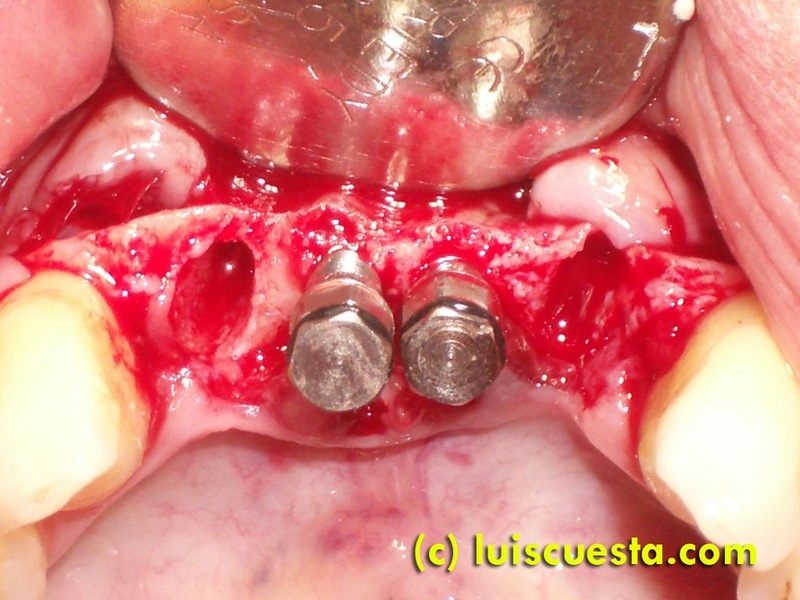 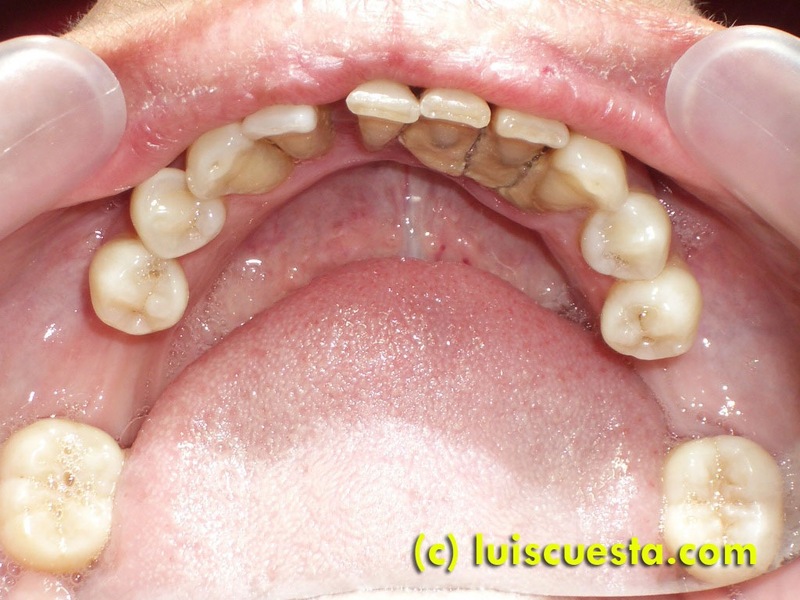 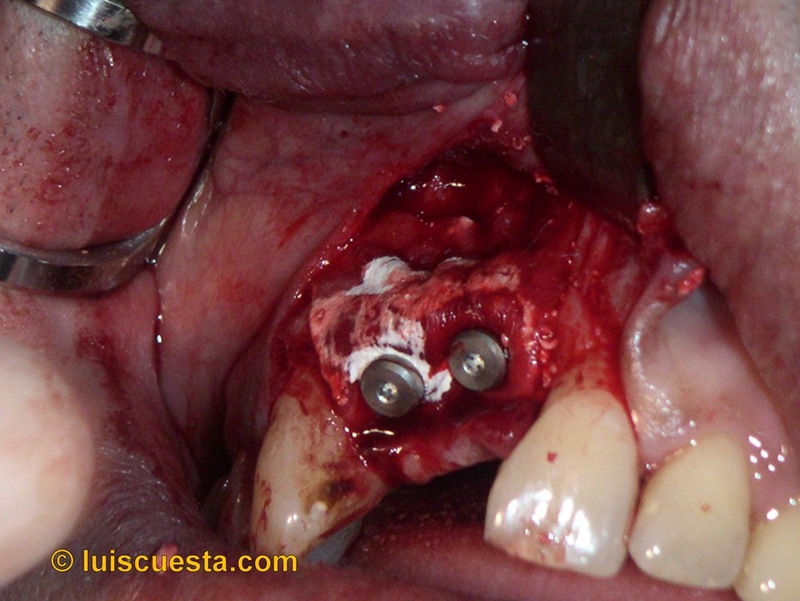 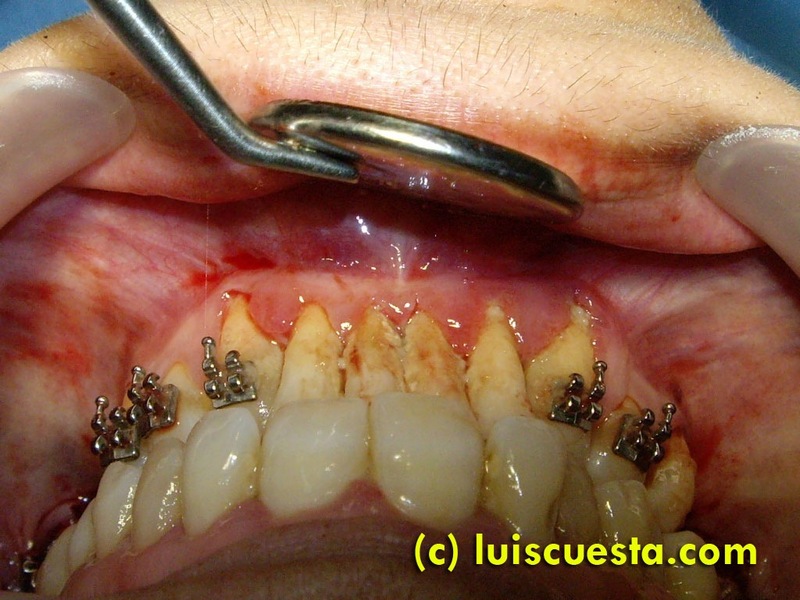 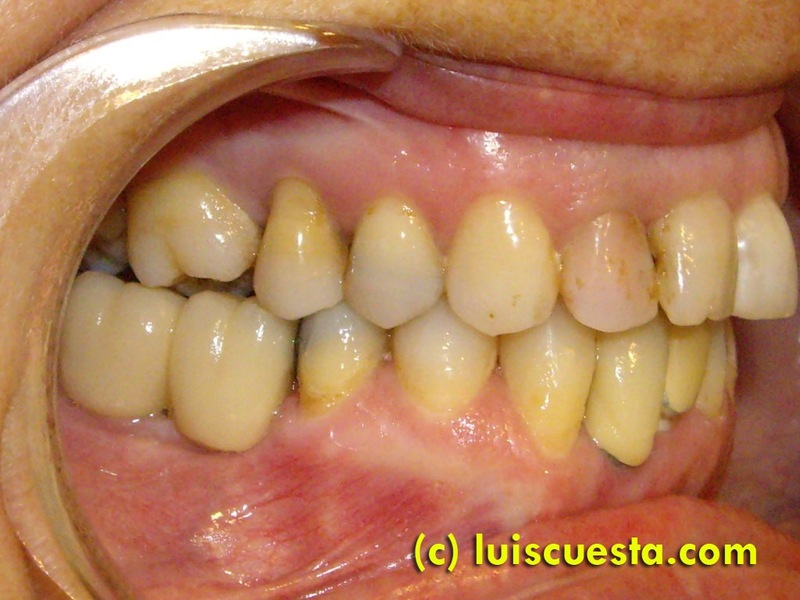 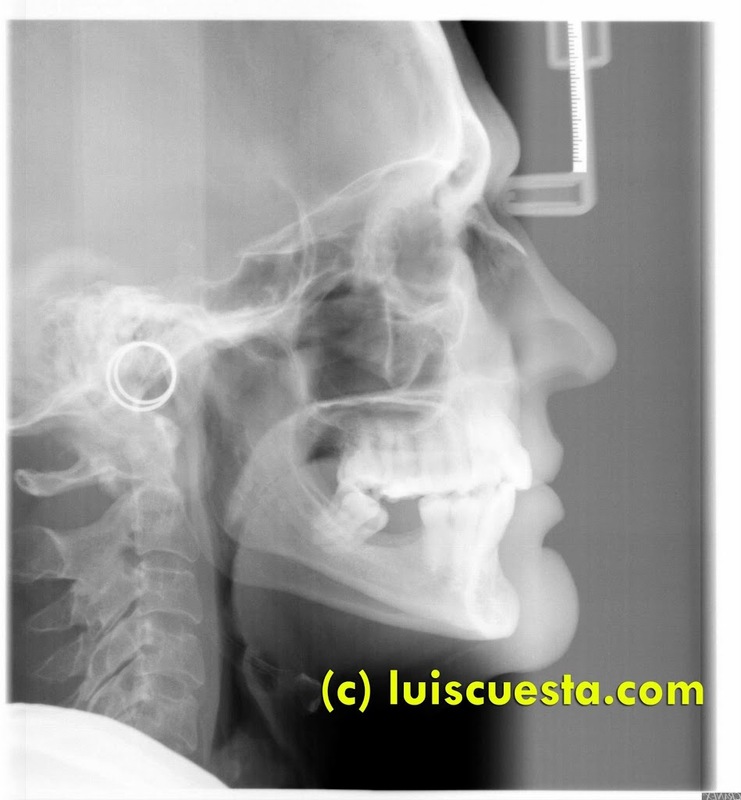 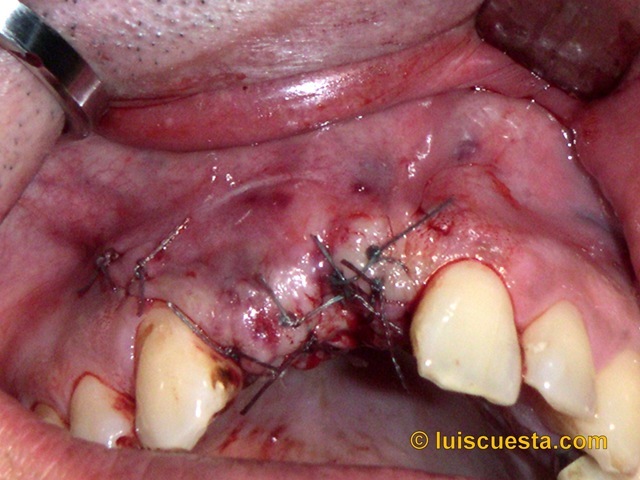 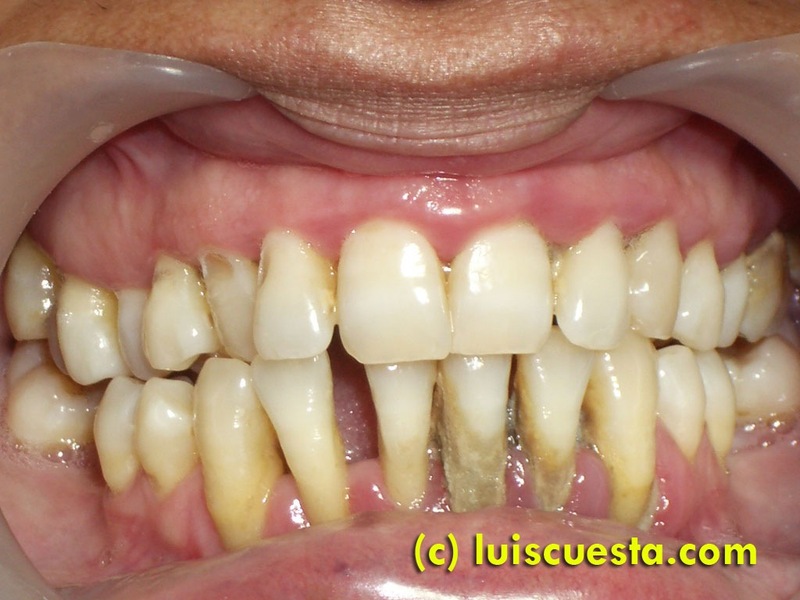 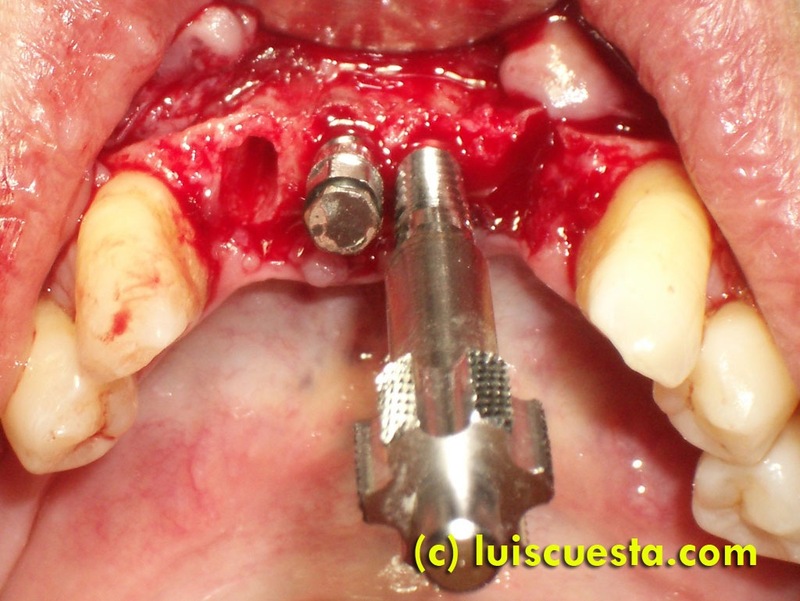 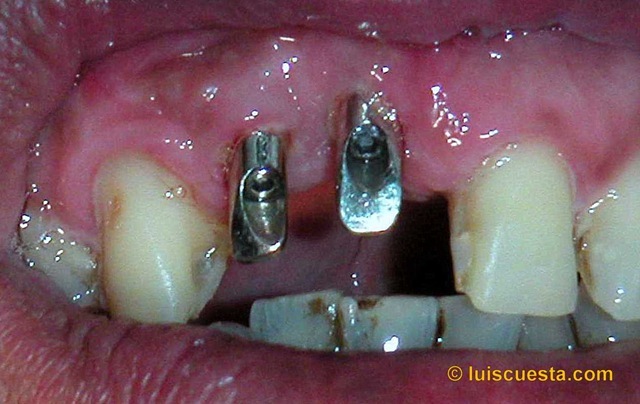 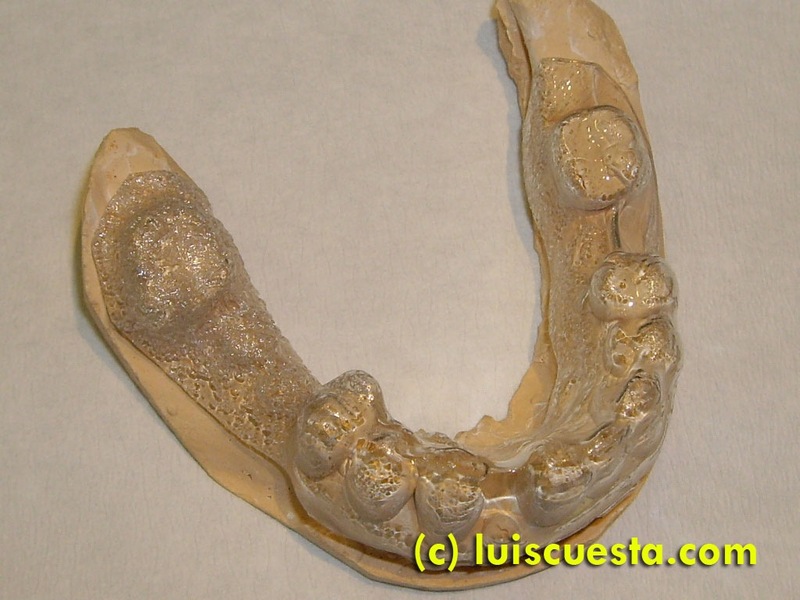 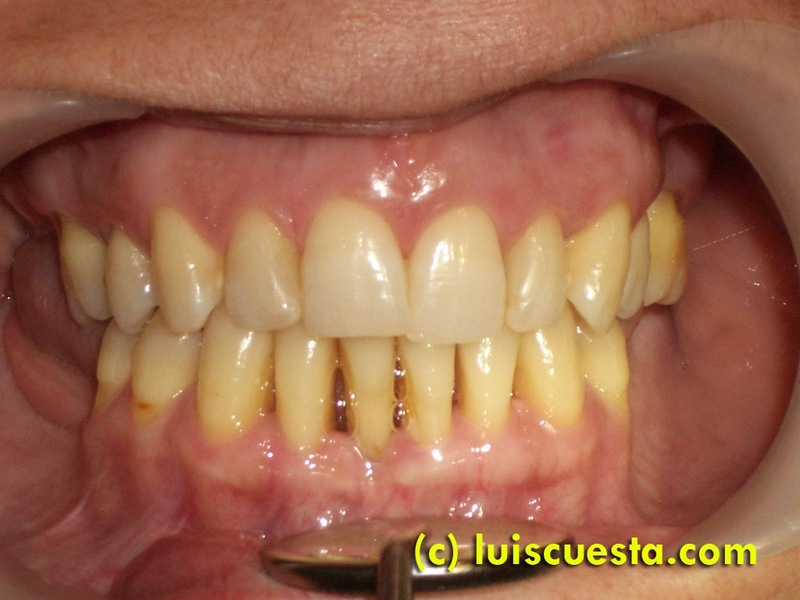 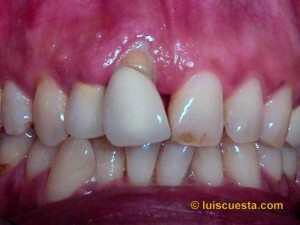 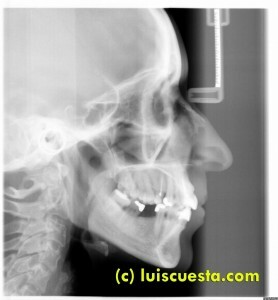 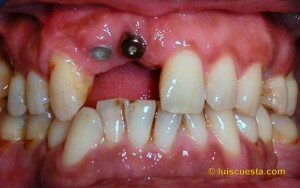 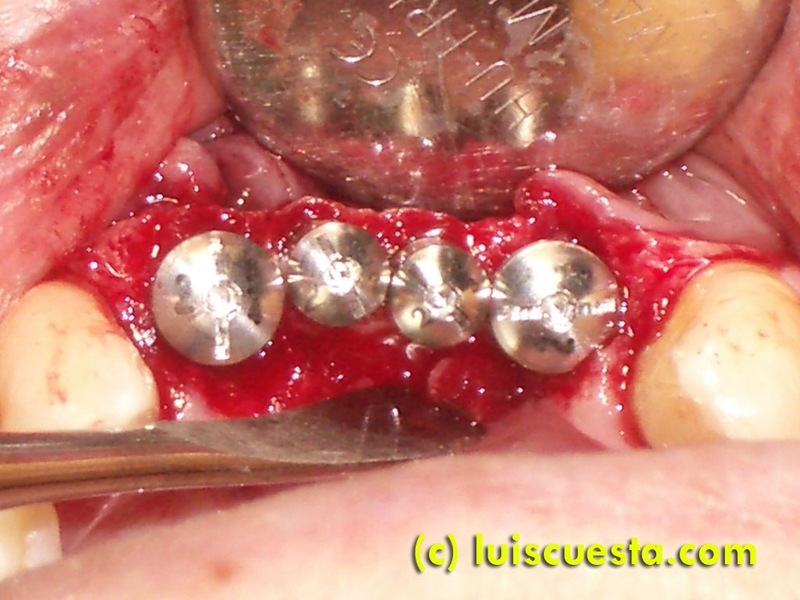 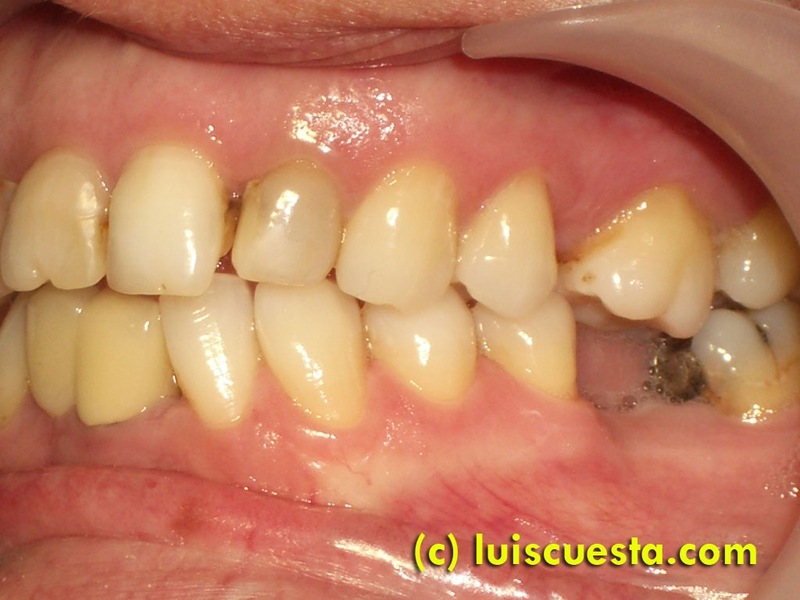 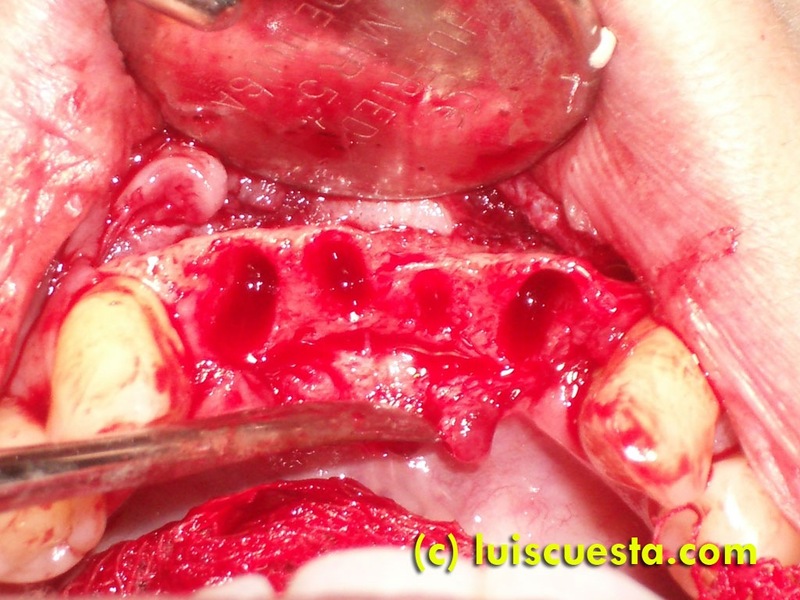 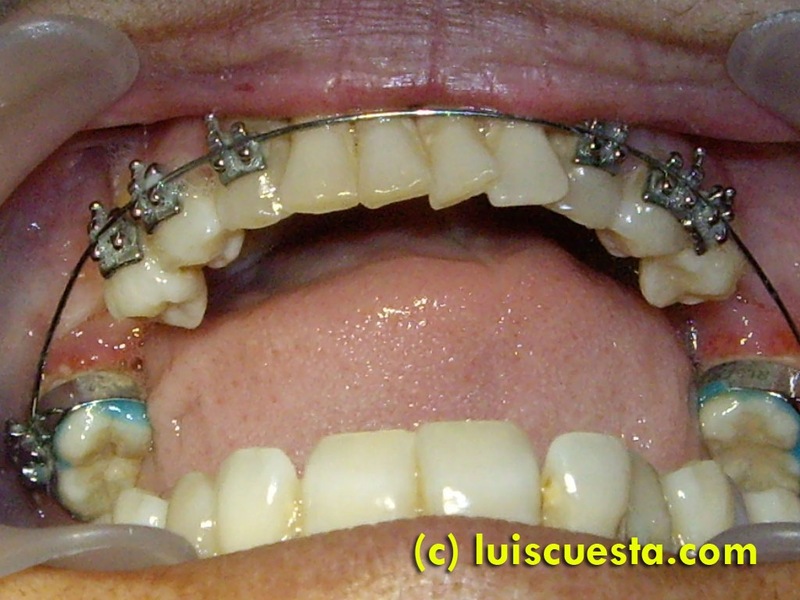 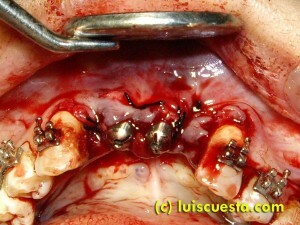 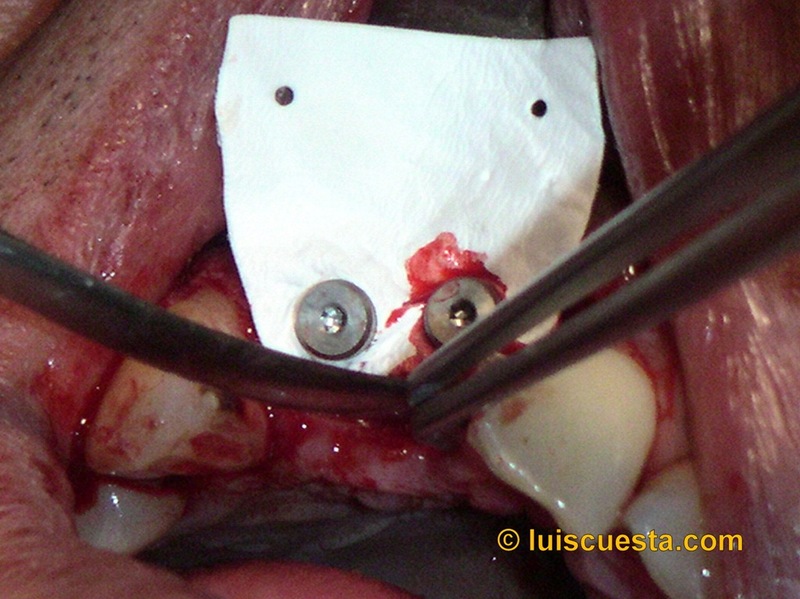 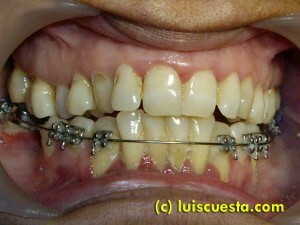 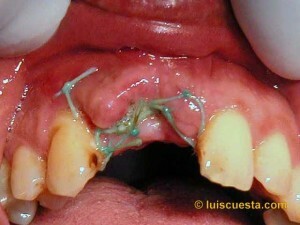 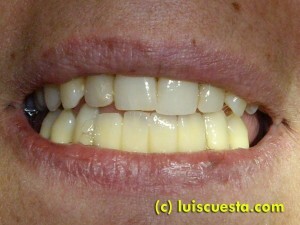 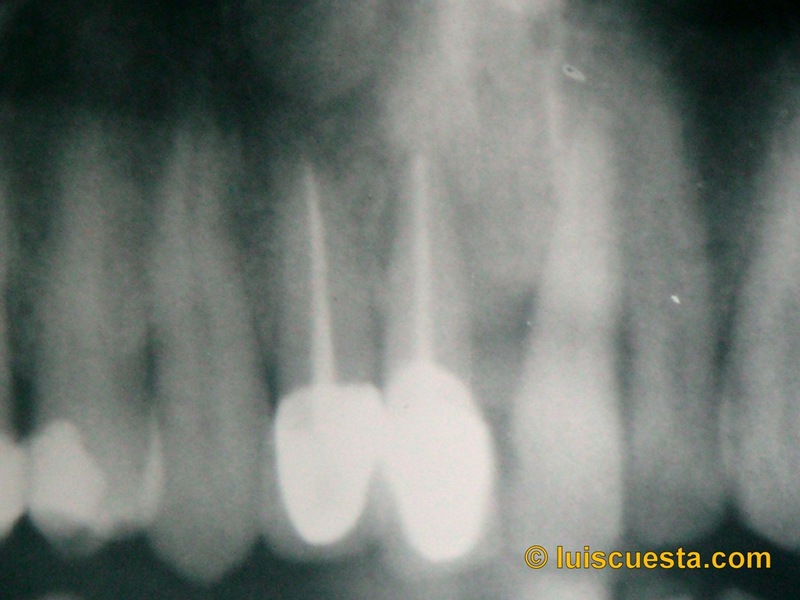 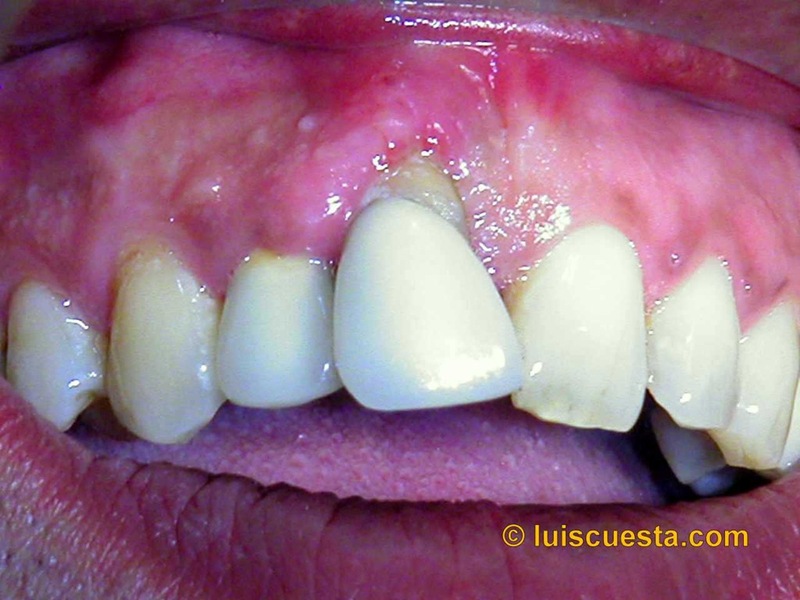 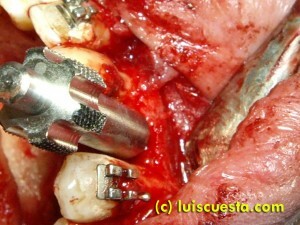 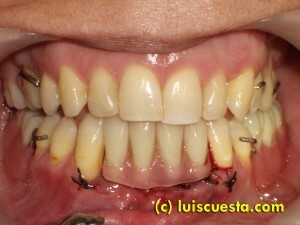 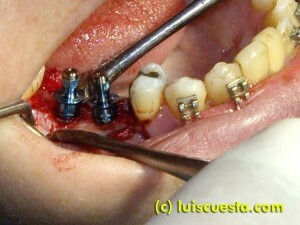 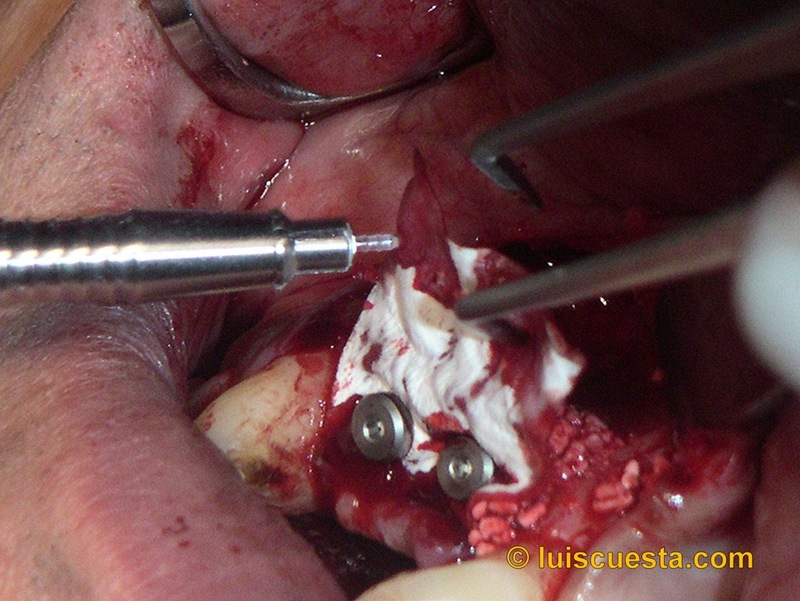 This case shows a treatment combination of orthodontics, implants and prosthesis. The patient lacks two molars on the lower jaw. 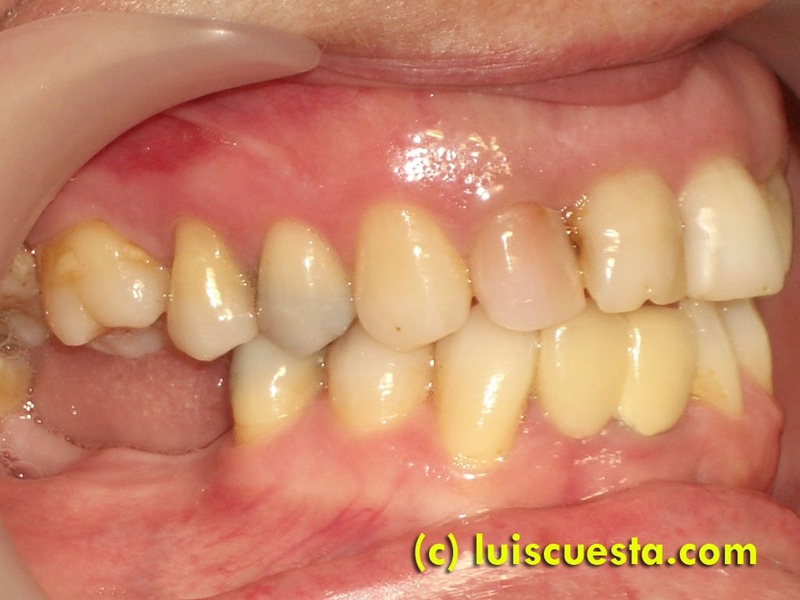 She has moderate to advanced periodontal disease, occlusal plane with a deep Curve of Spee and produces an incredible amount of calculus in a short time. She is experiencing the effects of tooth loss and periodontal disease. 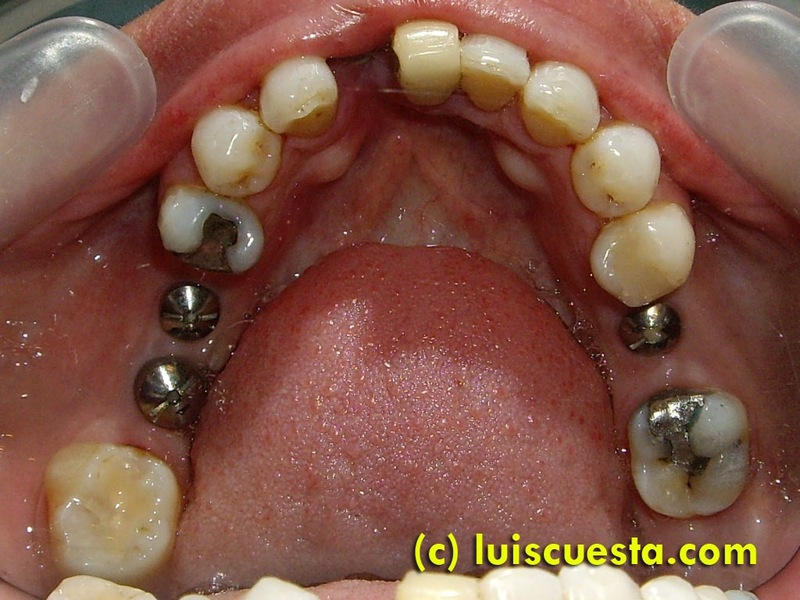 These are rear occlusal collapse, mesial tilting of the remaining molars and gap opening due to lack of bone support and tongue thrust. The molars could have been also extracted, but we decided to give them a chance. With the help of nearby implants and at a correct angle, their life expectancy will be extended and depending only on the evolution of the patient’s hygiene and the periodontal disease. 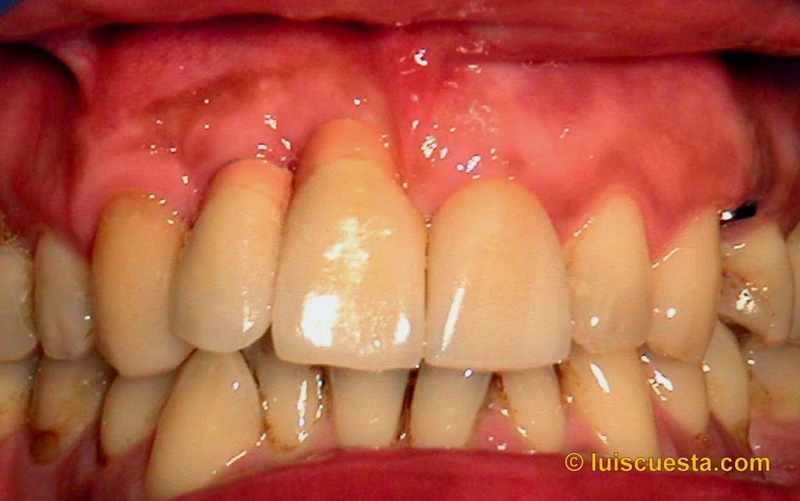 The lower incisors almost out of the bone and have a high degree of mobility. 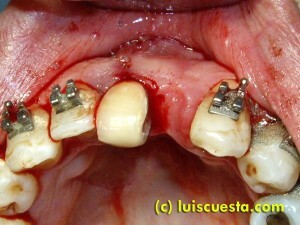 The decision was to replace them by implants after ortho. I used ortho treatment to flatten the occlusal plane, close the spaces and tilt the molars to vertical. I could afford crowding during the treatment because this would mean less space to cover with two implants. 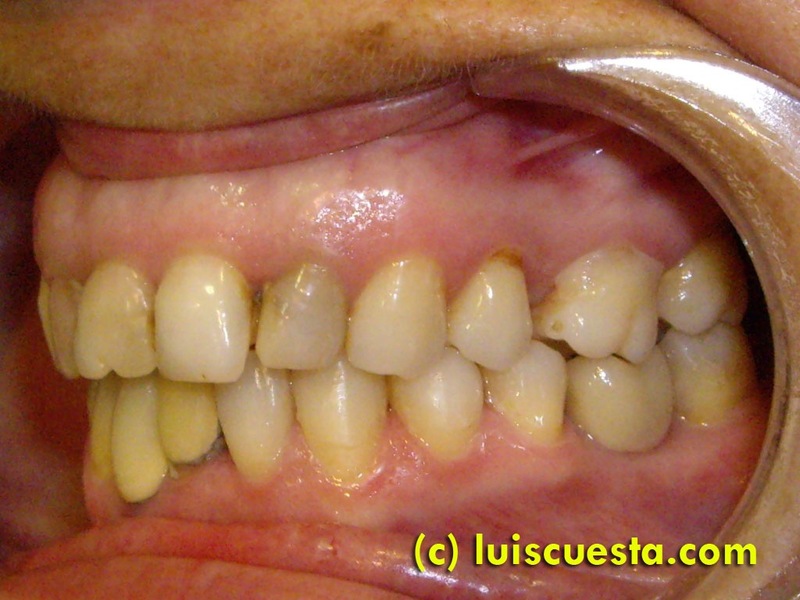 Note that the upper occlusal plane flattened by itself, without ortho. 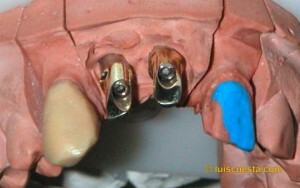 Implants are placed easily on the rear ends. 5×10” on the right and 4×11.5” on the left, brand 3i. Regarding the incisors, I pulled them out and placed the implants immediately. 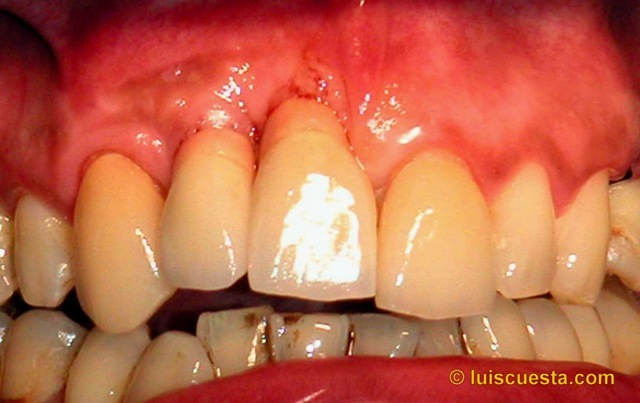 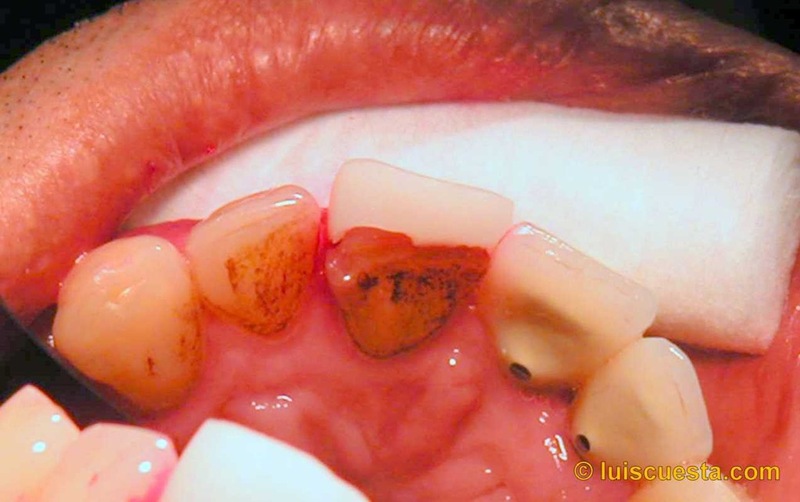 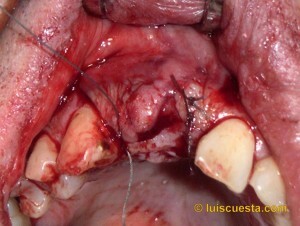 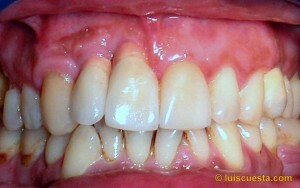 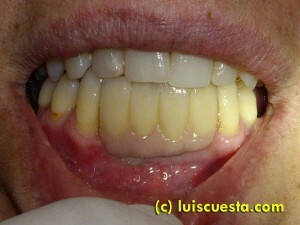 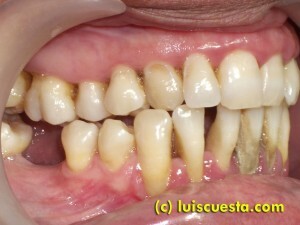 Waiting for the gum to heal after extraction often produces great ridge collapse in these periodontal cases. The with of the bone was enough for two 3.25×15” 3i implants. 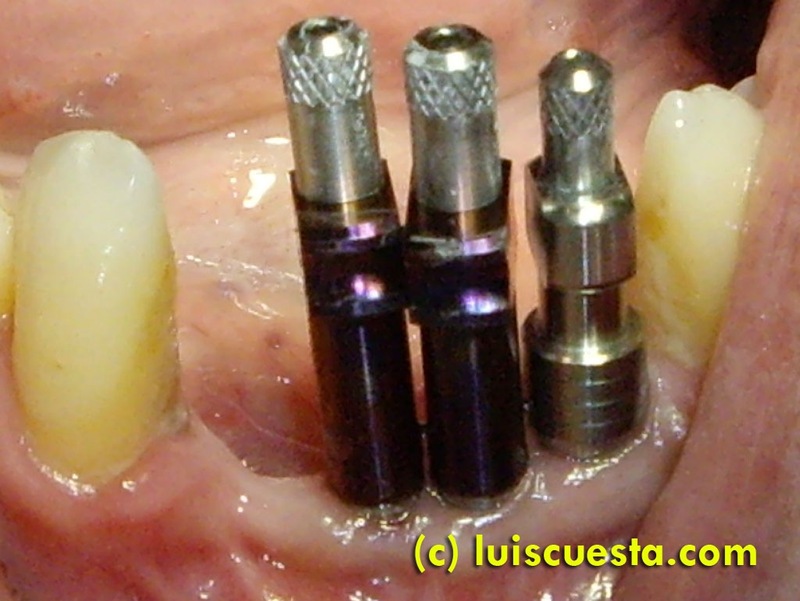 I prefer not to use 3.25mm of 3i brand, if possible. 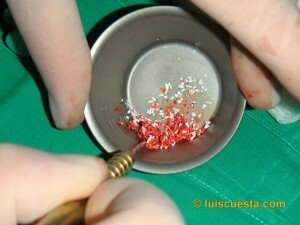 The thread is too short and too many threads probably heat the bone a little too much. 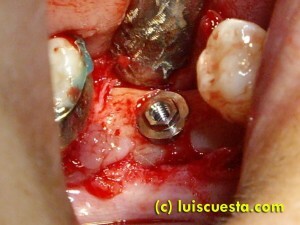 Failure happens more often than with regular thread implants. For me, the wider the thread, the better. 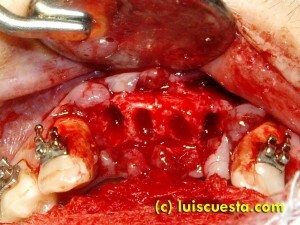 But I prefer not to try expansion in this case, as there is risk of fracture in any of the alveolus walls. A removable, acrylic, partial denture is used as temporary and space retainer, while a fellow colleague works on the ceramic crowns. The patient lacks teeth on the lower jaw, pieces 47, 46, 45, 36, 42 and carries a one-pillar bridge over 42, 41. Due to previous crowding, she had a lower incisor extracted. 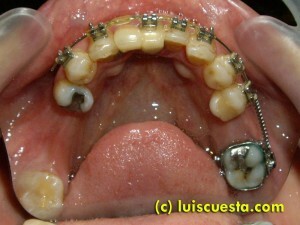 I used a quick ortho treatment lo help alignment and. 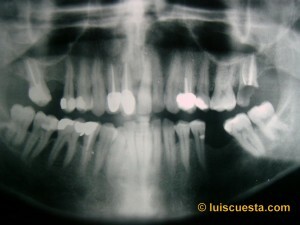 After extracting the lower left wisdom tooth (48), I corrected the first molar (46) angle, tilted forward after several years edentulous space. Implants are placed easily on the rear ends. But the space available on the incisors is always more critical. 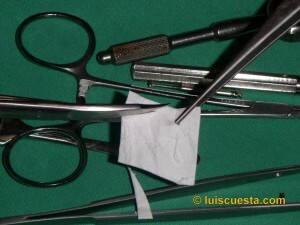 So, first I cut the bridge and, then, I open the flap. 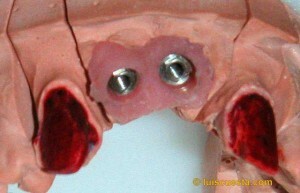 I run a set of expanders, since the ridge is rather narrow. 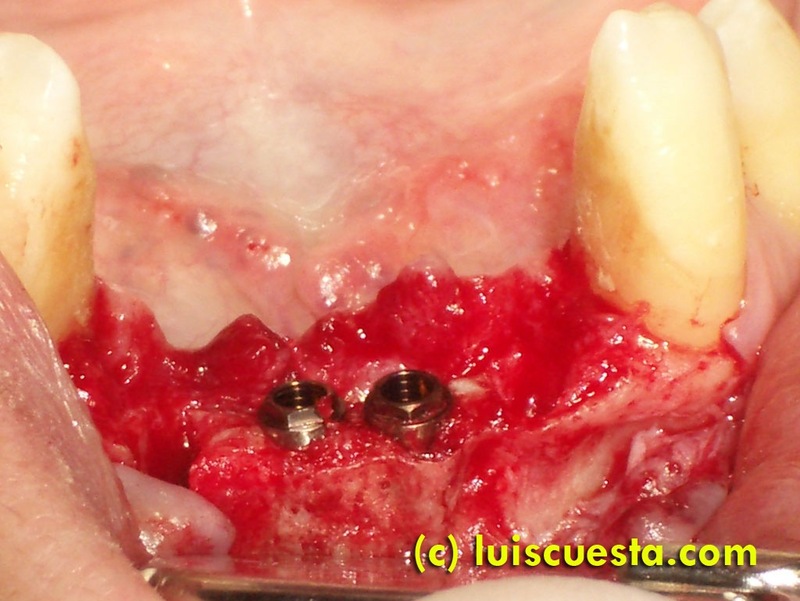 The bone’s concave shape in this region forces the implant to be inserted in a different angle than the adjacent teeth in order to avoid thread exposure of the implant. 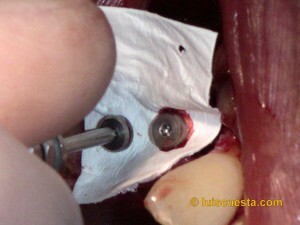 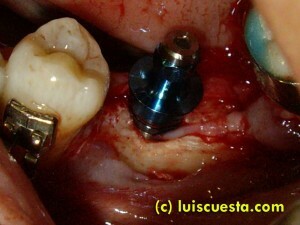 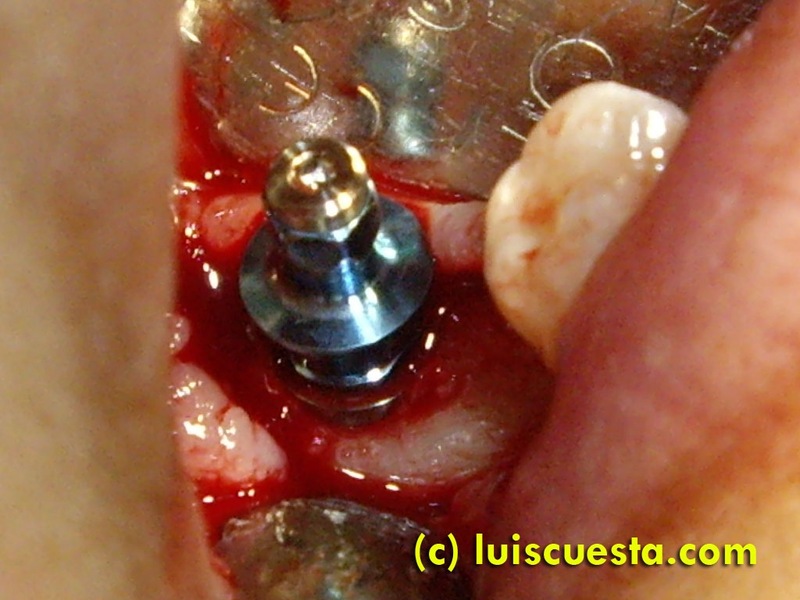 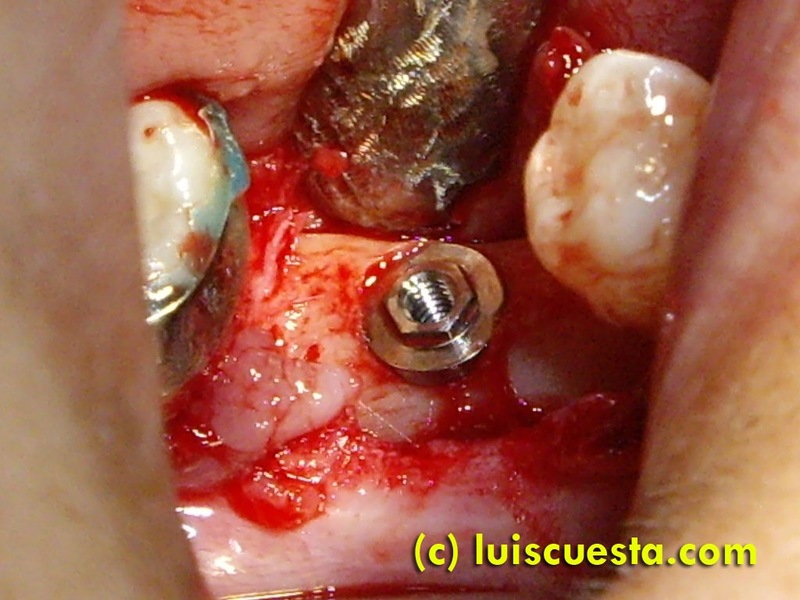 The implant is set in place, to the limit of bone elasticity for a 3.75x15mm implant. I prefer not to use 3.25mm of 3i brand, if possible.The thread is too small. 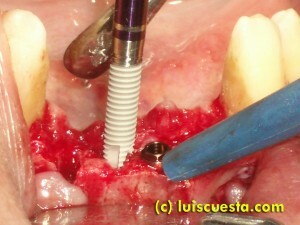 Too many threads probably heat the bone a little too much and failure happens more often than with regular thread implants. 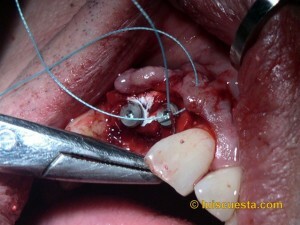 For me, the wider the thread, the better. I put the flap back in place with stitches and let the implants heal. 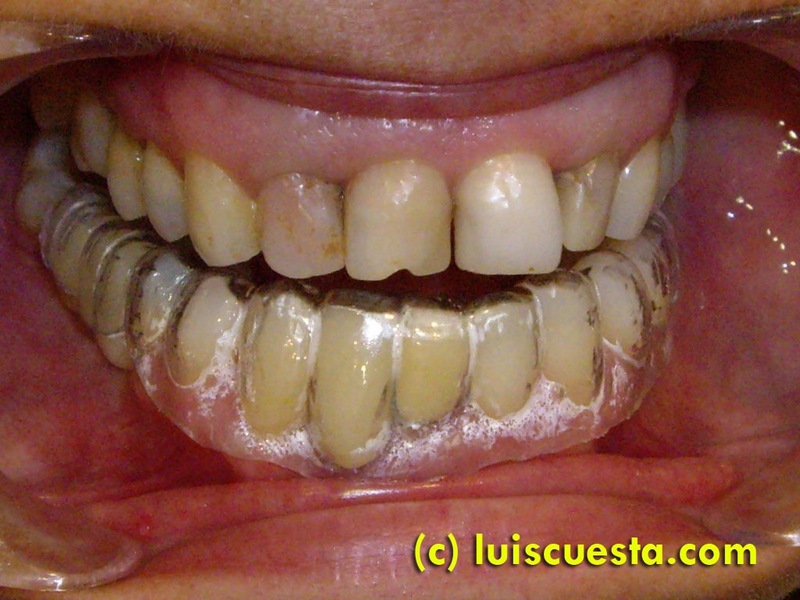 I remove the braces and use a thin, temporary clear splint for retention, to prevent the spaces from collapsing, while a fellow doctor works on the fixed prosthesis. When the prosthesis are finally fixed, I substitute the clear retainer for a new, thicker one, including the implant crowns. 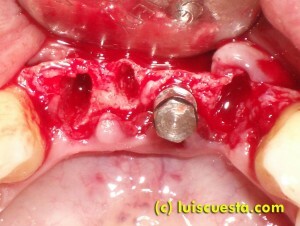 Final result. Note the different level of the gingiva in the incisors. Fortunately, This effect can’t be seen while talking. 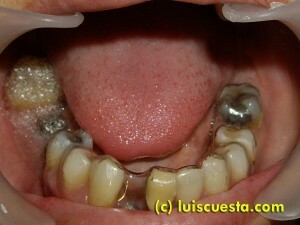 Now it would be time to start treatment in the upper jaw, to get better esthetics. 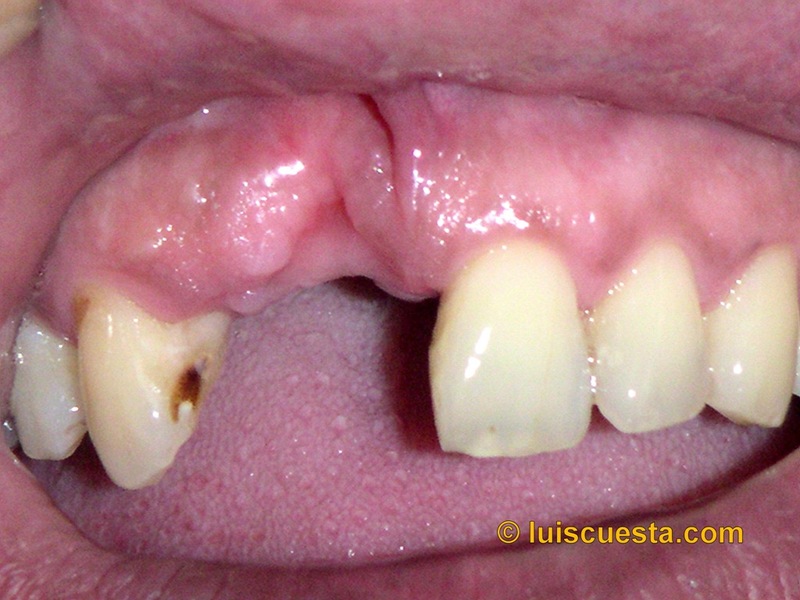 An asymptomatic decay is detected in between the two central incisors during a routine check. In the front view one can hardly distinguish but a slight color change. But the rear side shows a big decay under the dark colored spot. 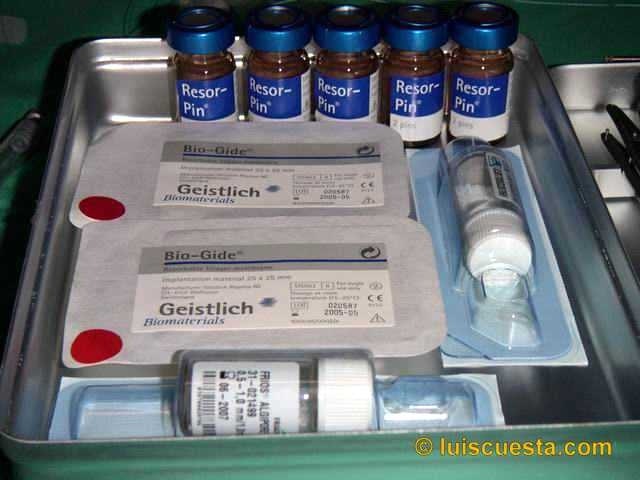 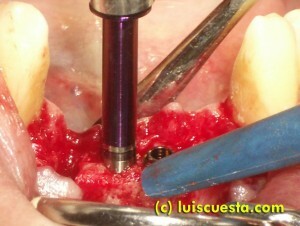 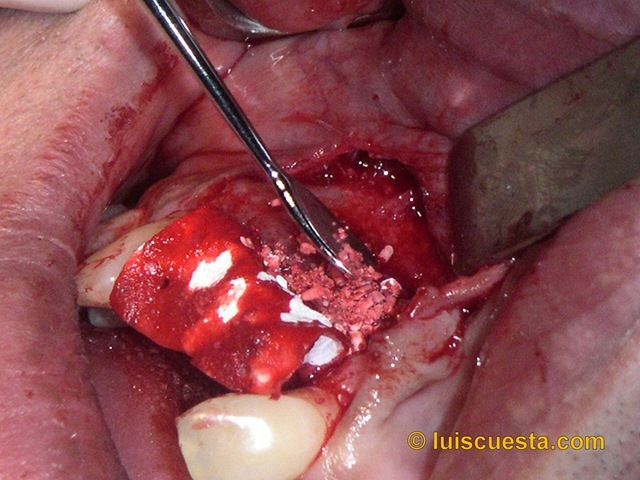 se prepara una cavidad en el esmalte para tener acceso a la dentina (parte intermedia del diente, entre el nervio o pulpa y el esmalte exterior). Estas caries casi siempre afectan a las superficies de los dientes contiguos. 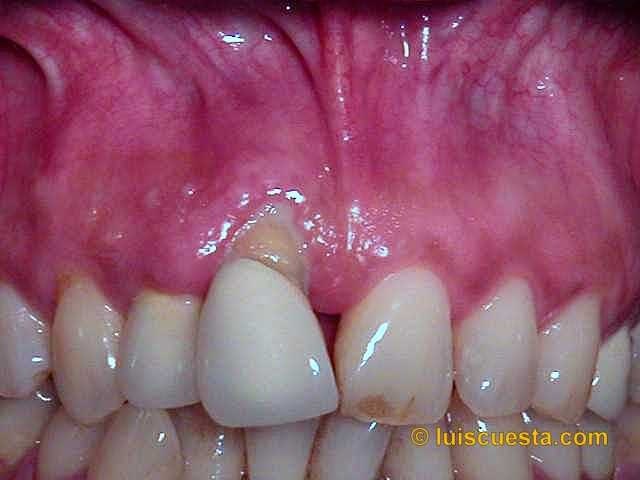 Una suele ser mayor que la otra. The cavity is drilled on the enamel in order to expose the dentine (intermediate layer in between the external enamel and the inner pulp). 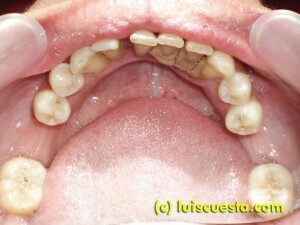 This cavity normally affects to both side by side teeth, but one is usually larger than the other. 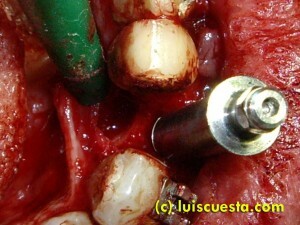 Decay is removed from dentine and the final shape of the preparation is carved. 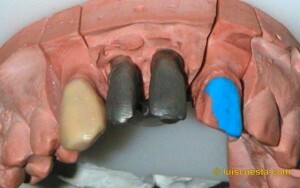 Then, I place the composite filling, in small amounts and mixtures of colors, in order to get maximum color camouflage. 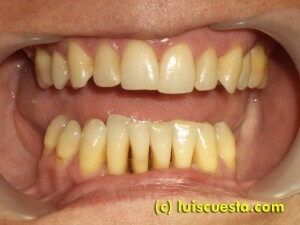 vista después de la obturación, con un excelente resultado estético. 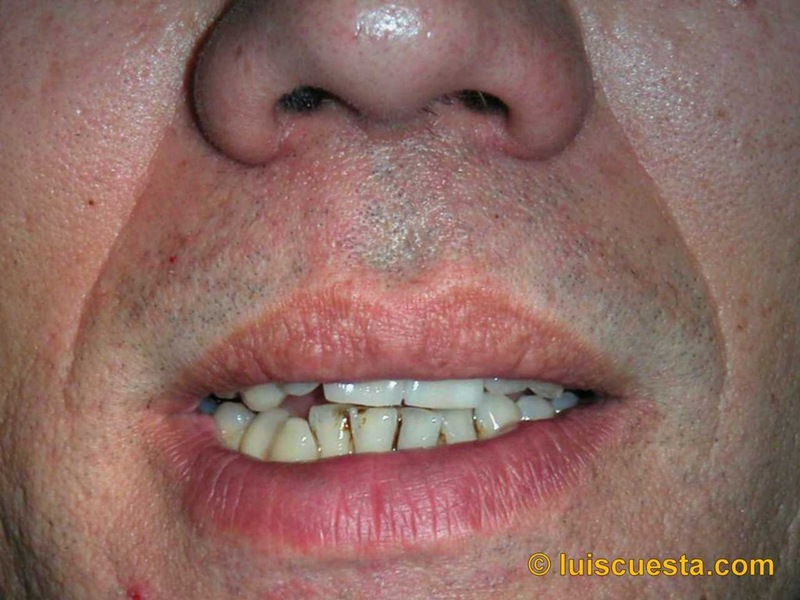 Nadie podría adivinar lo que hay detrás. 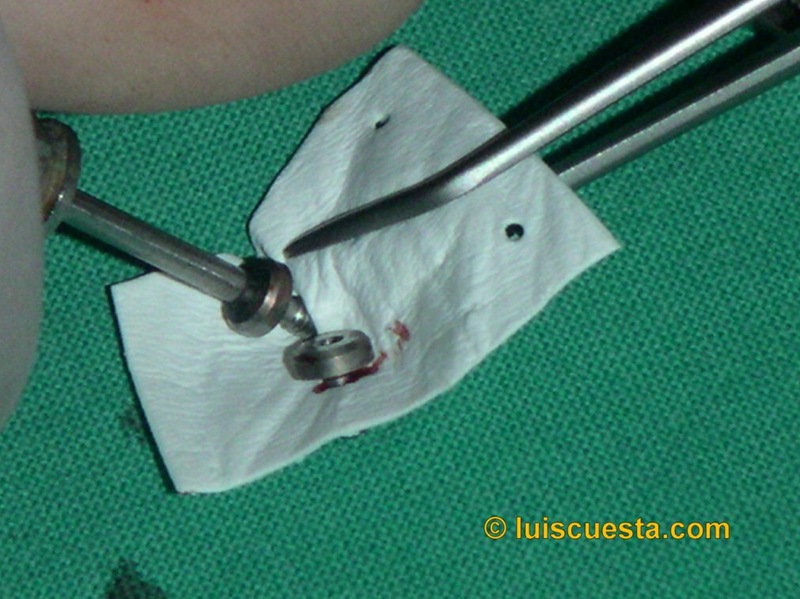 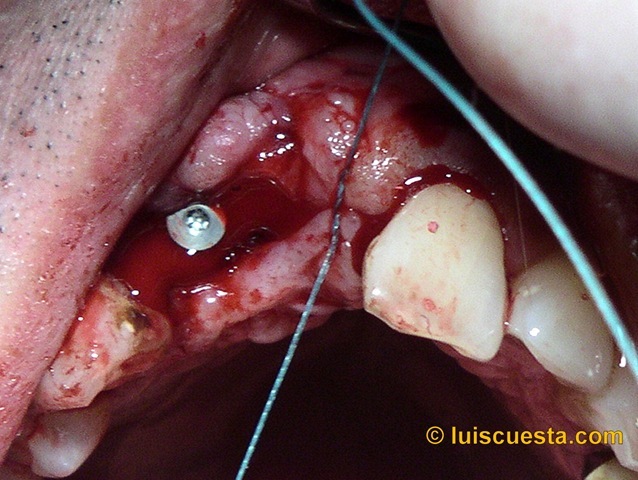 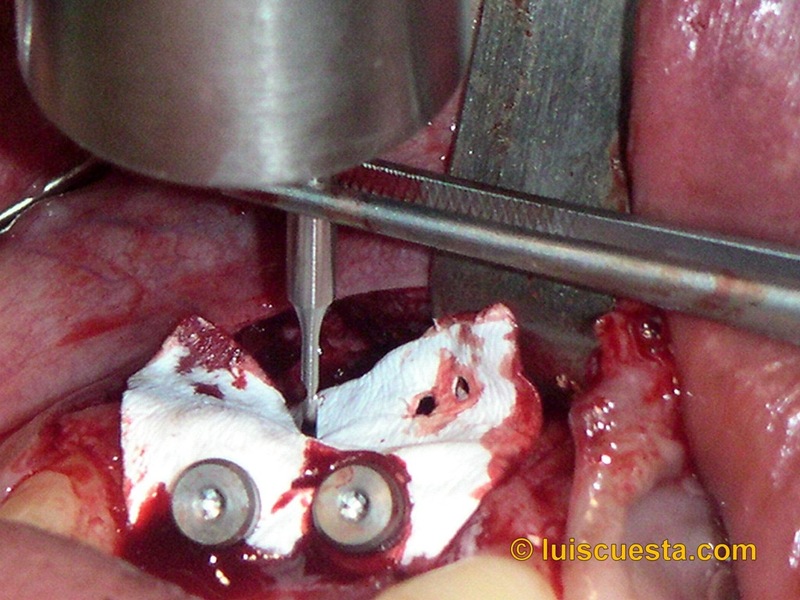 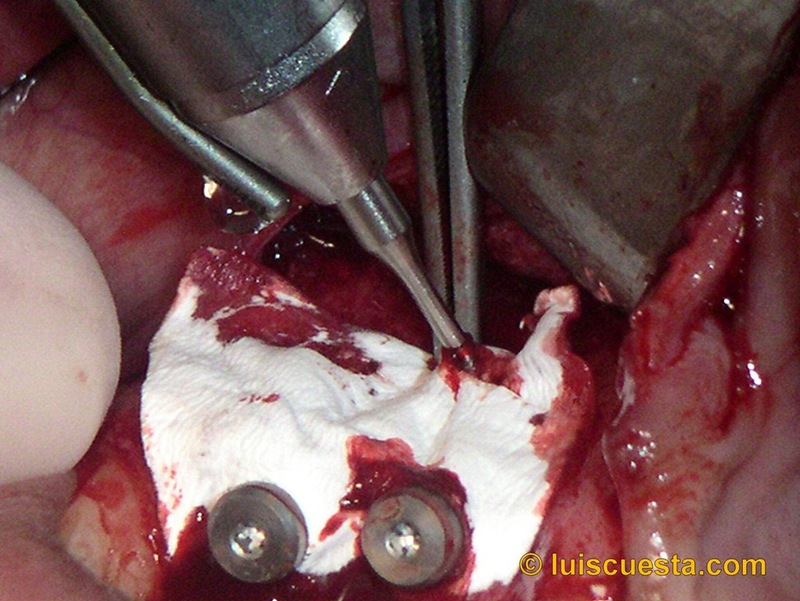 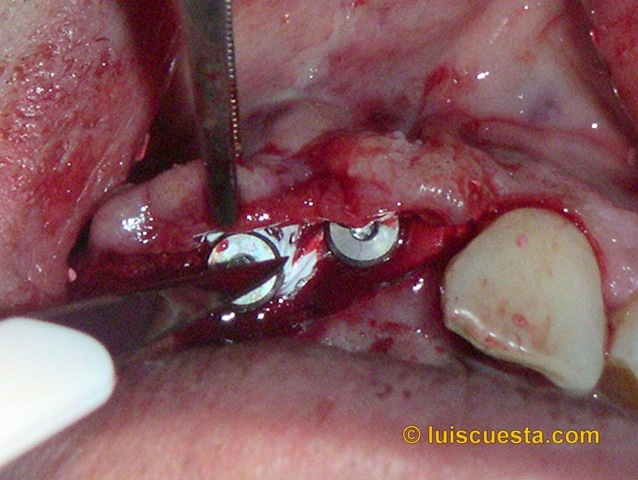 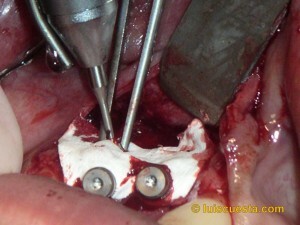 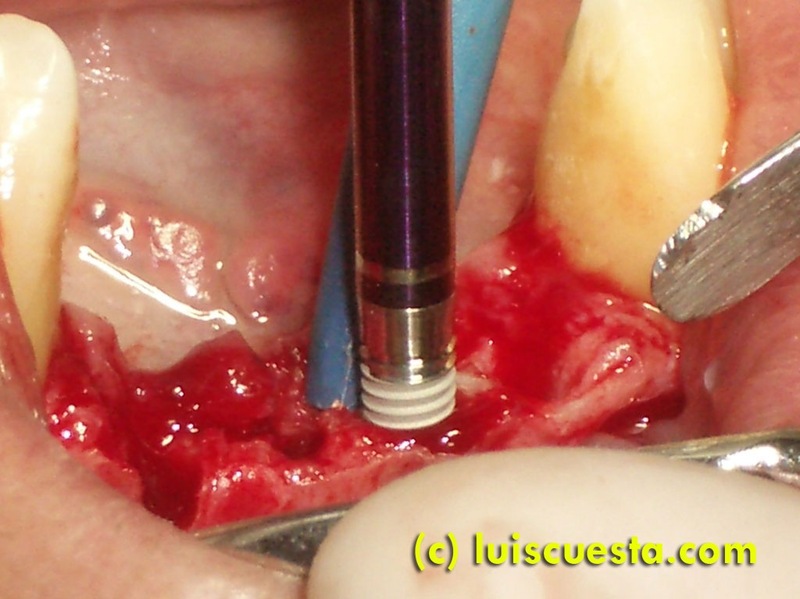 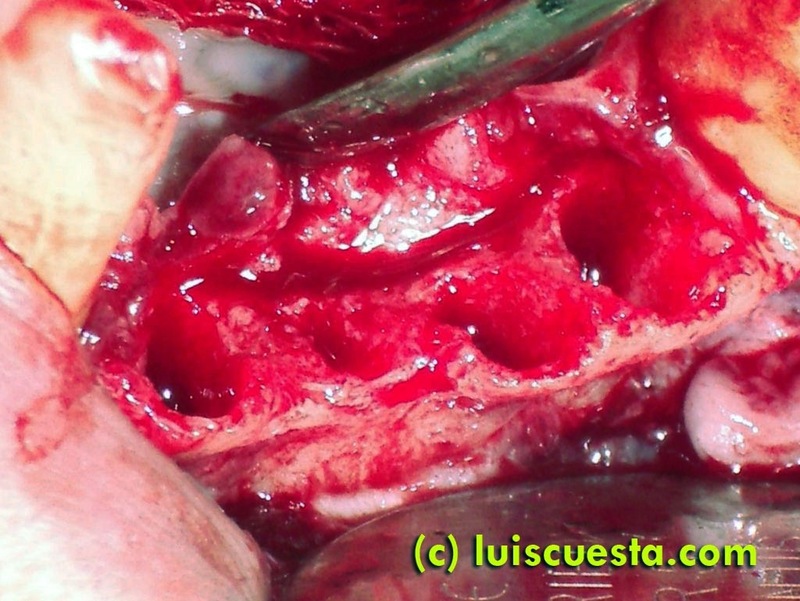 Bone regeneration around the neck threads of an ICX implant. 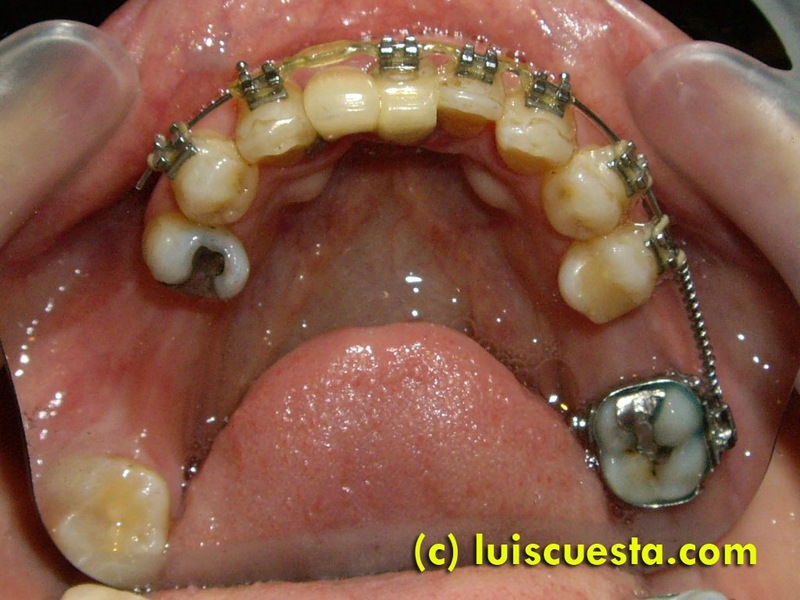 One-year control.